I will try to reconstruct based on other source for this lineage history of this series. 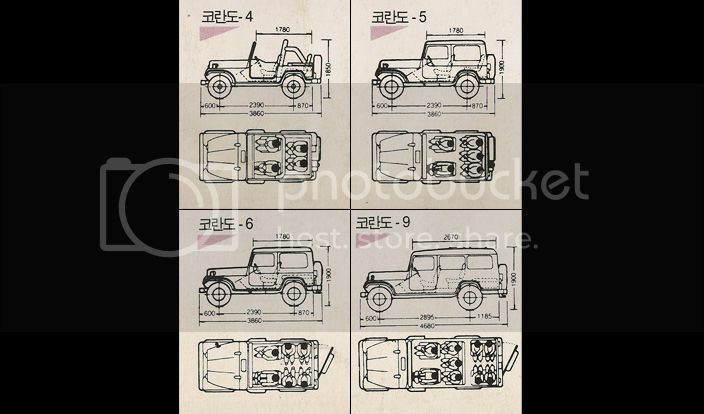 The civilian Jeep history of our country starts in 1969 with 4 cylinder gasoline jeep that Shinjin Motor Industry Co., Ltd. supplied with parts from American KAISER Jeep and assembled and sold 3,000 units. 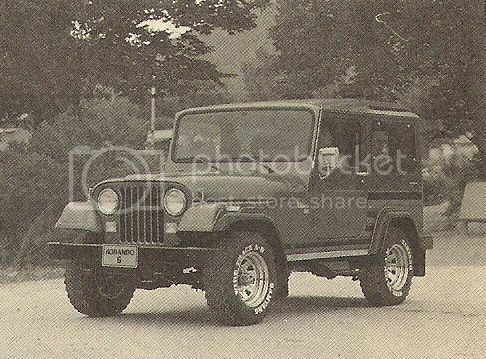 Some sources indicates that the 10-passenger long wheelbase version was introduced in 1971 model year along with pickup truck version. 신진지프부터 코란도 투리스모까지~ 코란도의 역사! 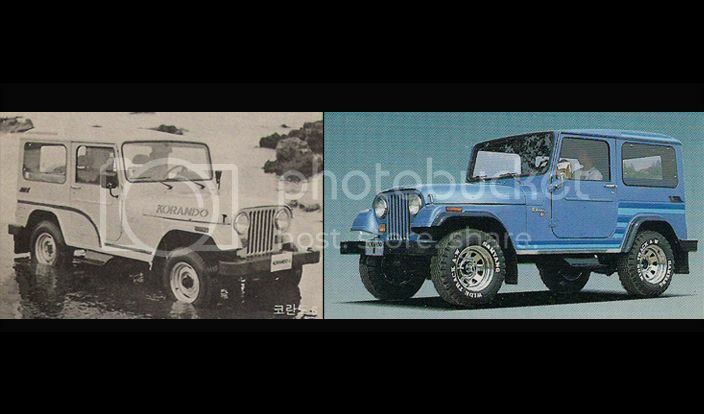 (Google Translate:) From Shinjin Jeep to Korando Turismo ~ History of Korando! 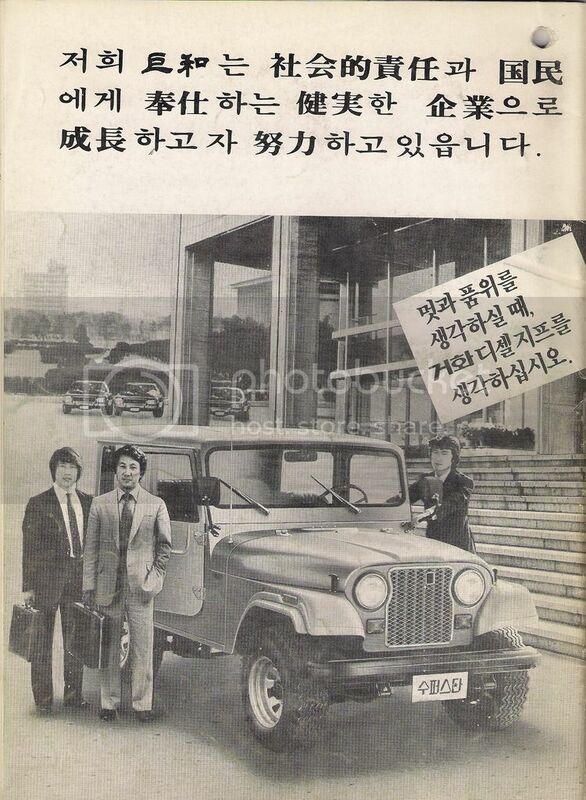 In April 1974, Shinjin Motor Co., Ltd. and AMC of USA established a joint venture with Shinjin Jeep Automobile Industry Co., Ltd. to establish a technical alliance. 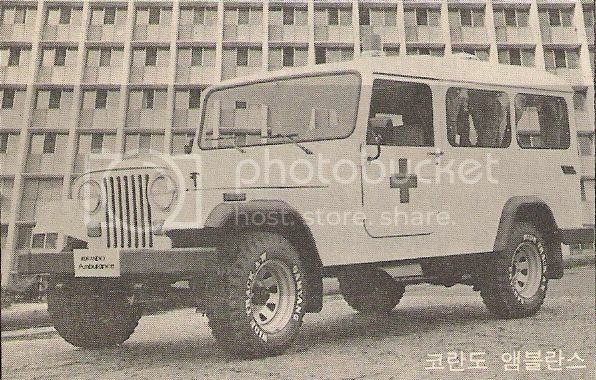 The 6-cylinder gasoline jeep CJ model (4-passenger canvas top / hardtop, 3-passenger van, 12-passenger wagon, Pickups) in earnest, and mass supply to demanding countries such as military / export / private sector. 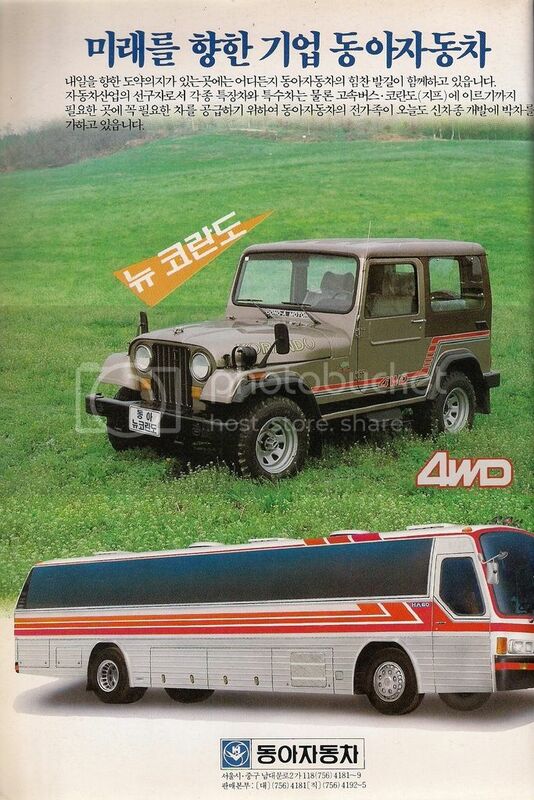 In March 1979, Shinjin Jeep changed its name to Shinjin Motor Co., Ltd. and developed the world's first diesel engine ([Isuzu B Series diesel] 4BA1 model) in November of that year, and started mass production of economical vehicles that can overcome the global oil wave. 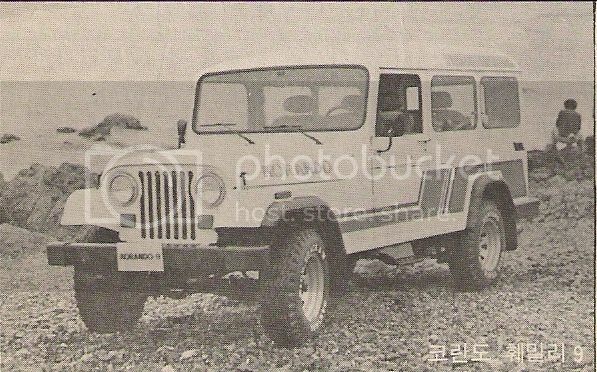 Shinjin Motor Co., Ltd. implemented the front model change of Jeep in September 1980 and changed its name to Keohwa, Ltd. in March, 1981. The word Keohwa (Hangul: 거화) (Hanja: 巨和) contains the meaning of 'Everything is harmoniously coordinated and a lot of people come together and make a big contribution to the world'. 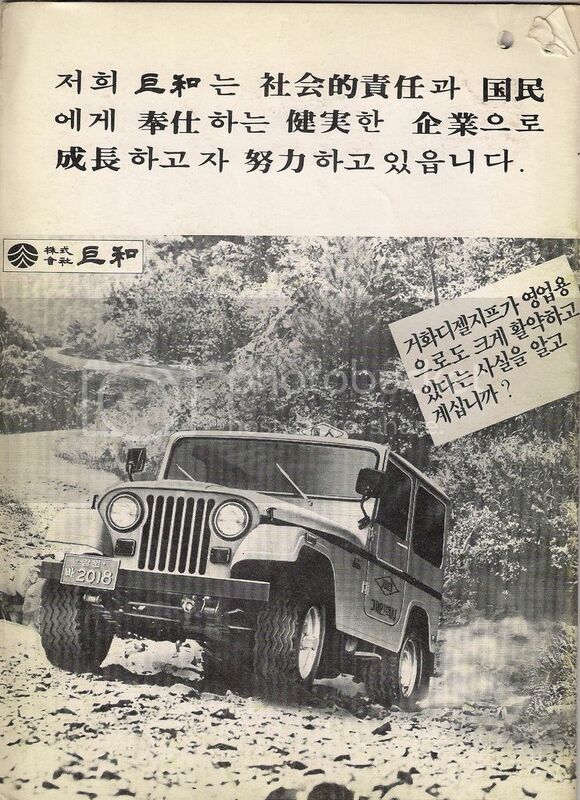 This is the April 1981 advertisement sheet with Hanja script of (株式會社 巨 和) labeled over from the previous company name of Shinjin Motors (Ltd.) which it roughly translated to Keohwa Corporation. 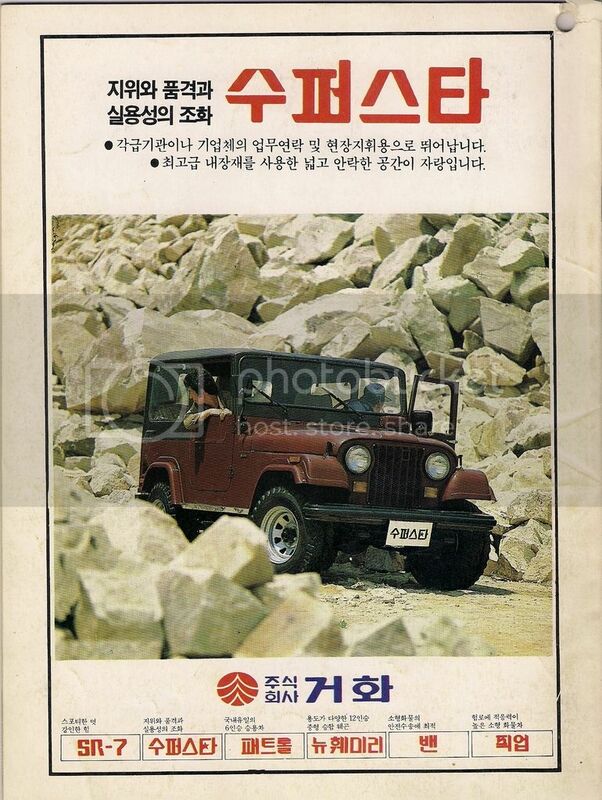 In May 1981, a commercial jeep "Patrol" was released. 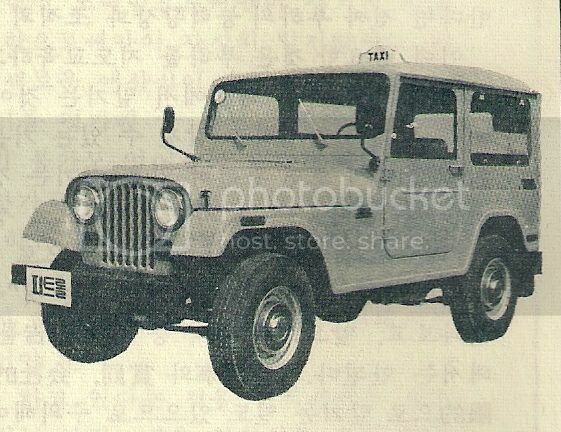 This is because, on December 1, 1980, the Ministry of Transportation reported to the Gangwon Provincial Government that there was no reason to restrict the registration of the Jeep car as a taxi business model. "We need to get a fuel change authorization," he said. 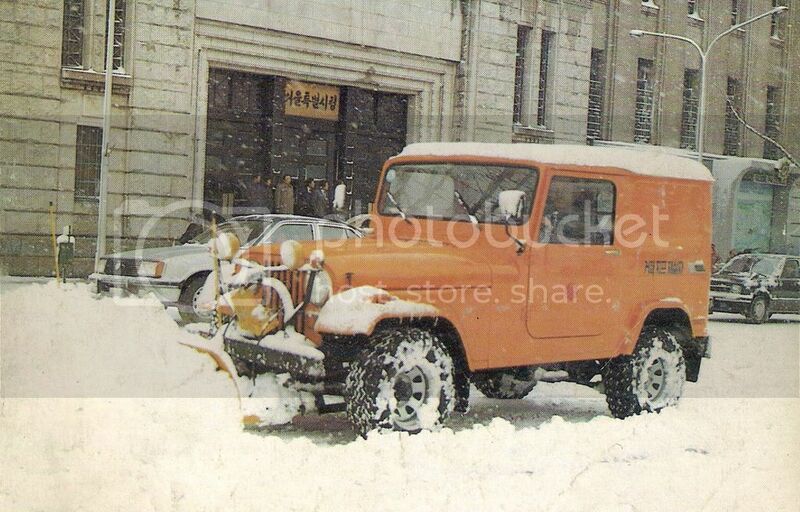 September 1981 Snow Plow was developed and released. The snow removal equipment consists of a mold board, an operating device, and mounting equipment. The blade of 2m length can be easily controlled by hydraulic pressure. Gimpo International Airport Management Corporation, Road Corporation, Korea Electric Power and other exhibits showed good response. 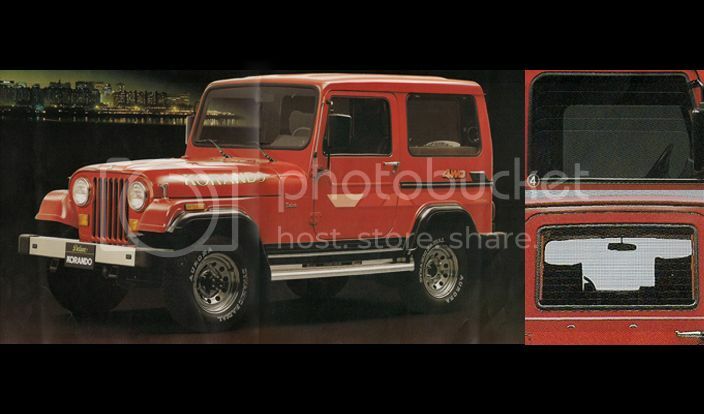 Author's note: It listed with SR-7, Superstar, Patrol, New Family, Van, and Pickup body style. 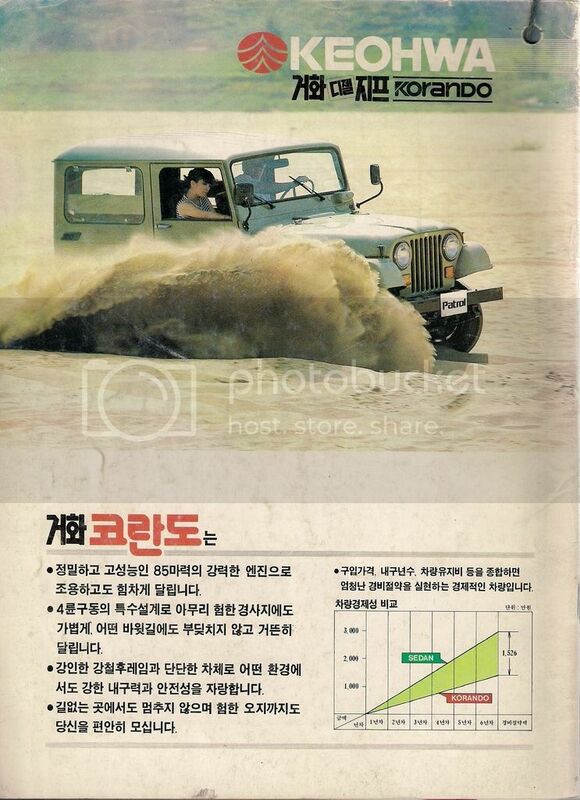 Curiously, it mentioned that they have 25 years experience with Jeep which it means that it dates back to Gukje Sibal Jeep. 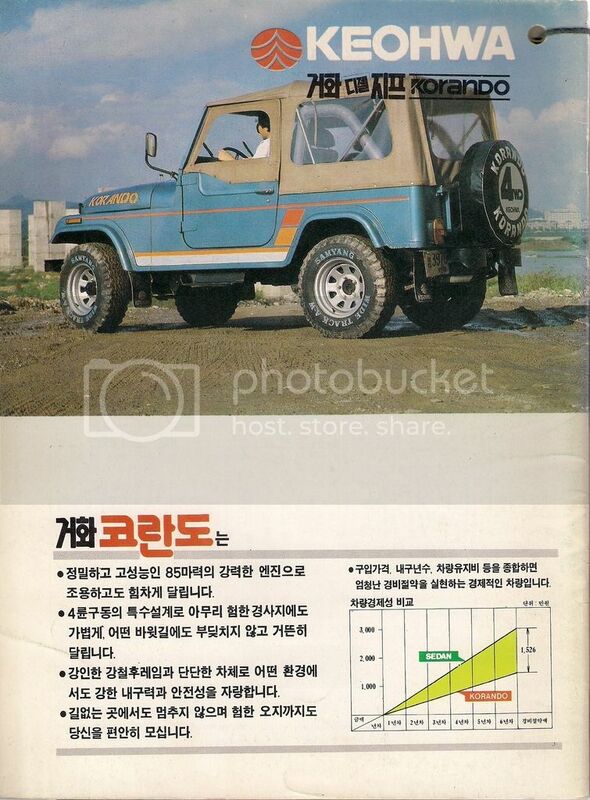 The "Korando" brand was first introduced to the public at the Seoul International Trade Fair held on September 24, 1982. 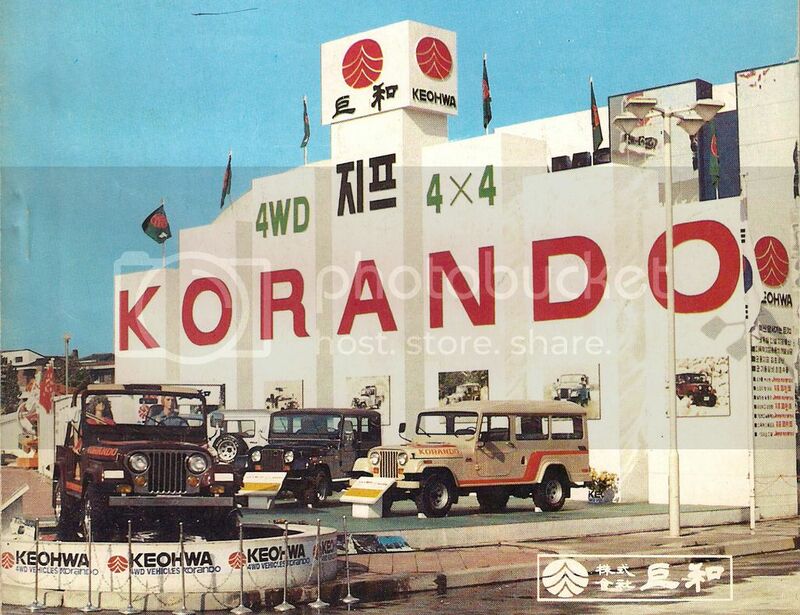 At the time, 676 domestic companies and 262 overseas companies from 40 countries participated in the fair, and Keohwa Co., Ltd. gained great support for the "KORANDO" mark, which means "Korean Can Do" A total of 7 large-scale columns were arranged in a soothing arrangement, and the overall atmosphere was utilized. 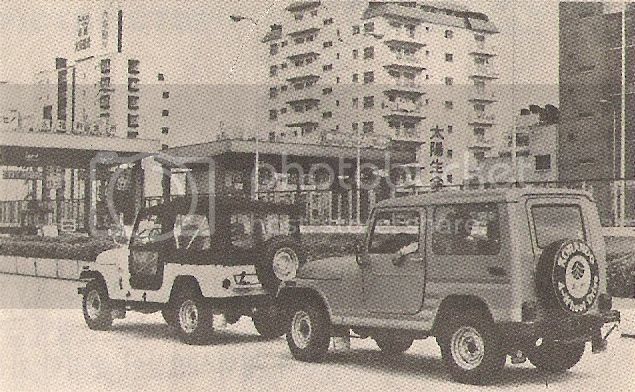 Four large military units and four civilian units were displayed, displaying a total of eight "Korando", attracting many visitors. 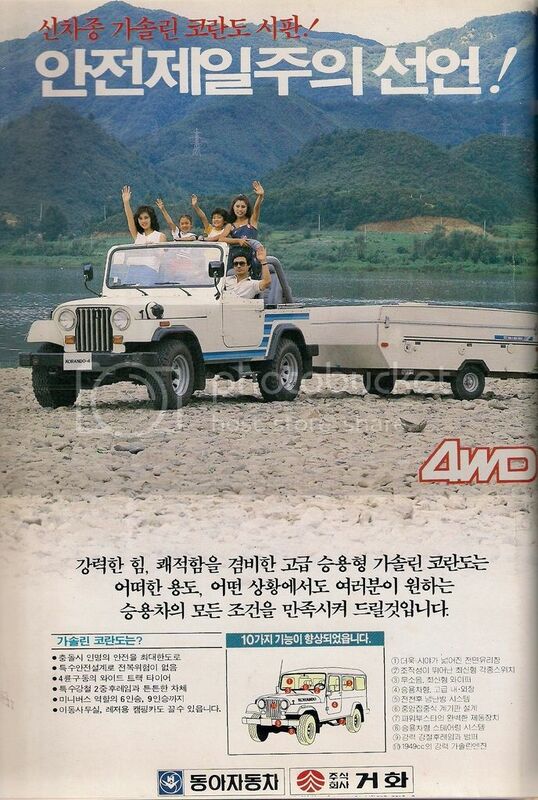 In December of 1982, Keohwa Co., Ltd. developed and marketed '9-seater Family Deluxe' for the first time in Korea. 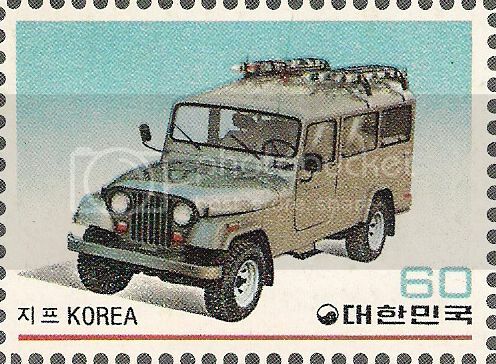 In February 1983, the Ministry of Communications published a series of domestic car stamps to honor the growth of the automobile industry and to diversify the stamp issue materials. 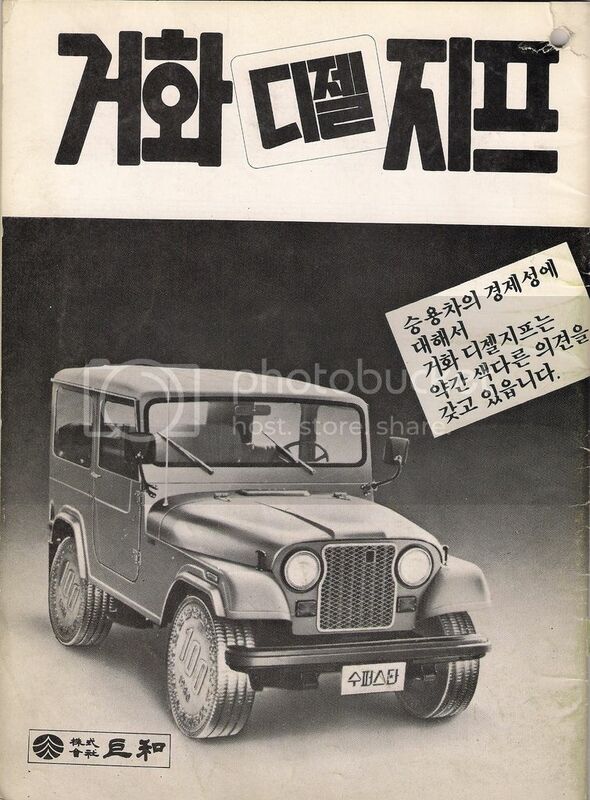 First, 'Family Deluxe' and Hyundai 'Pony' were adopted and 3 million copies were issued, respectively. 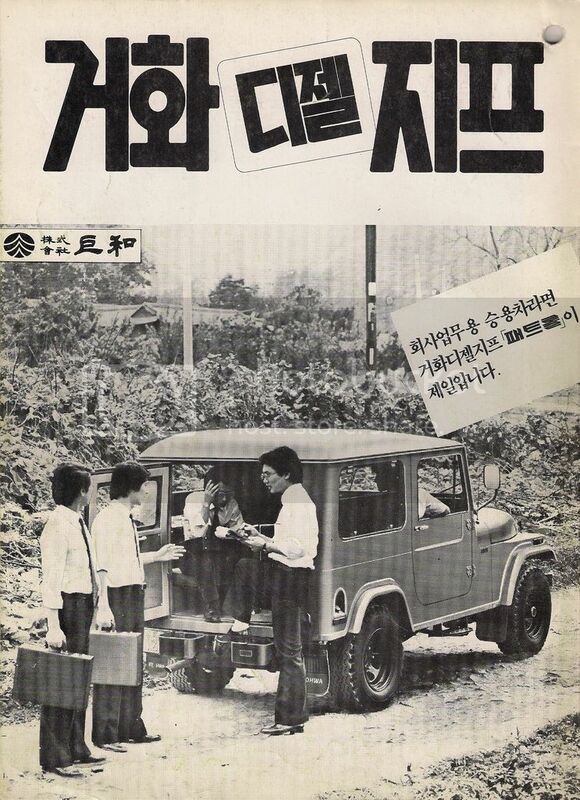 On February 1, 1983, Keohwa Co., Ltd. donated two "Family deluxe" to KBS, which is going abroad for production of "An account of travel to the five Indian kingdoms" (Wang ocheonchukguk jeon), (왕오천축국전) or (往五天竺国传). 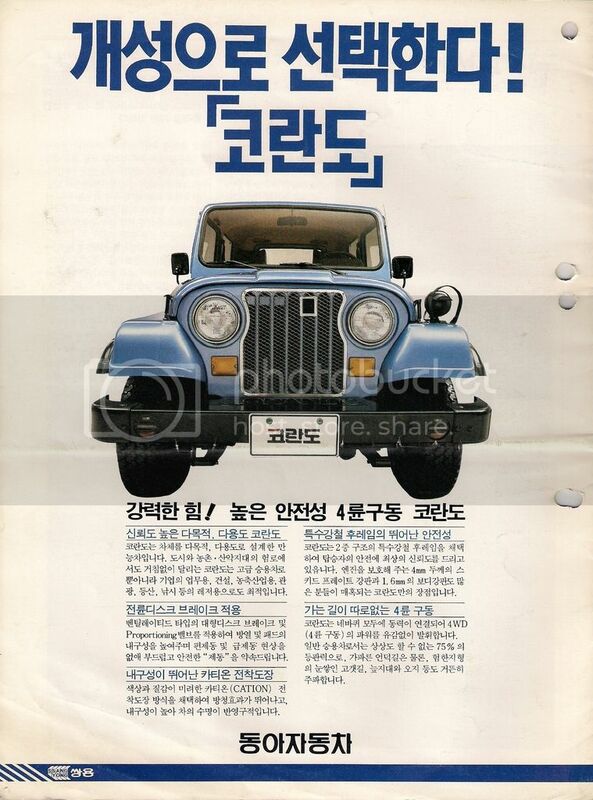 On February 16, 1983, the "Korando" (‘코란도’) trademark was registered and used from March. 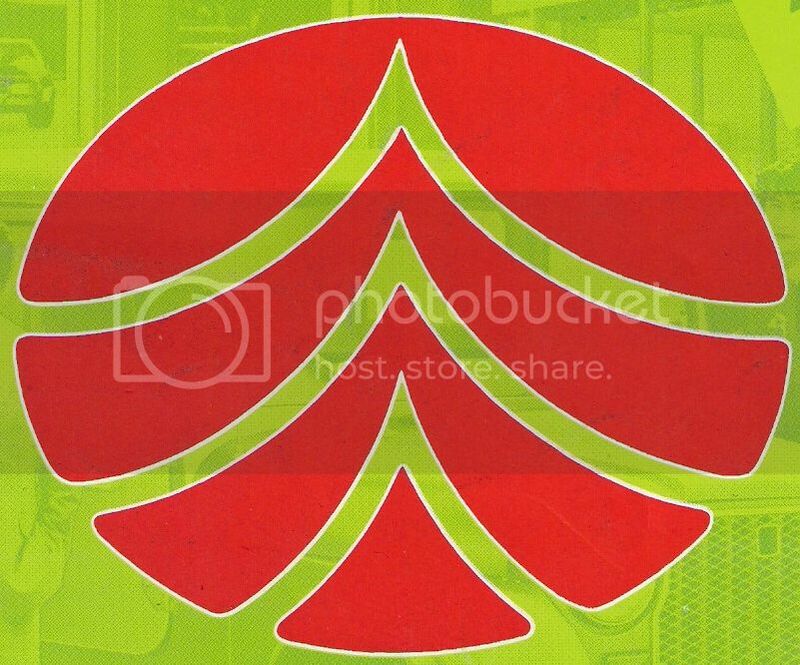 This was done after the trademark filed on July 7, 1982, was announced on November 3 of the same year. 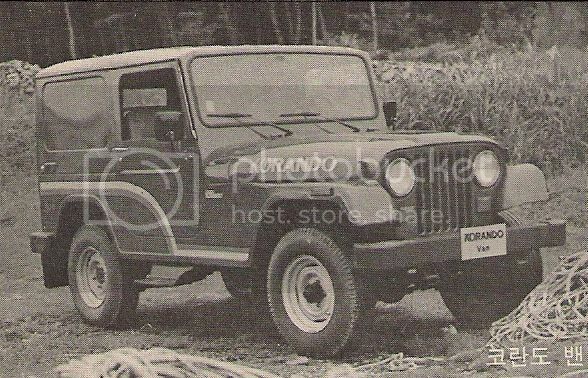 The trademark 'Korando' is a trademark that Keohwa has established as a substitute for 'JEEP', the exclusive trademark of AMC's four-wheel drive vehicle. 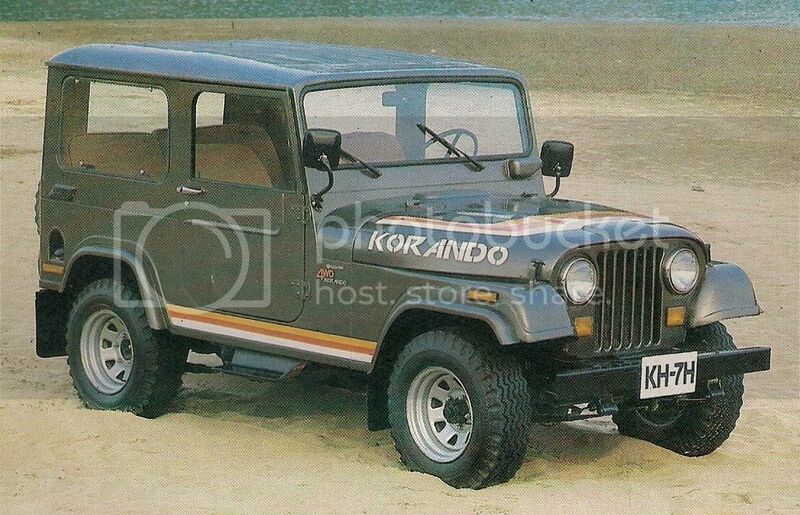 Its origin it's a pronoun of 4WD cars developed in Korea, And 'KOREAN DO IT' as 'KORANDO'. 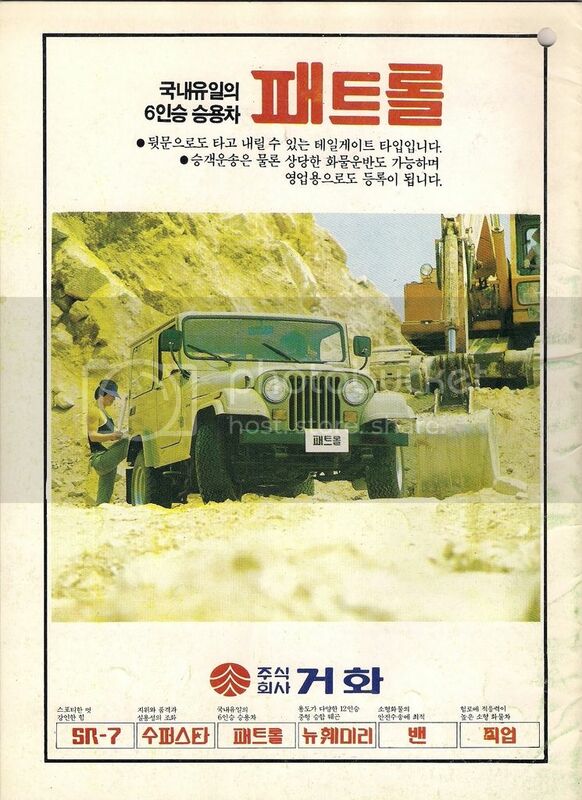 It also has the meaning of 'Korean land over' and 'Korean land dominator'. 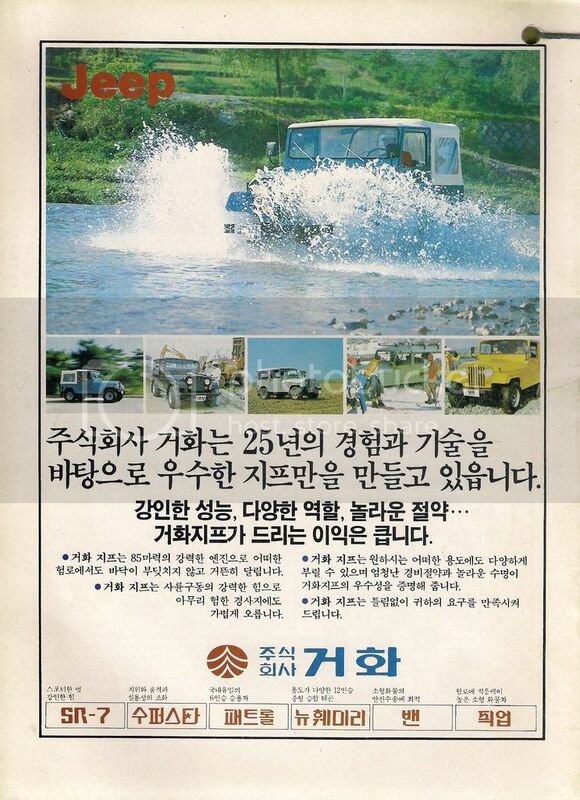 Since then, with the acquisition of Ssangyong Group's Dong-A Automobile, it has given a new meaning to "Koreans can do". 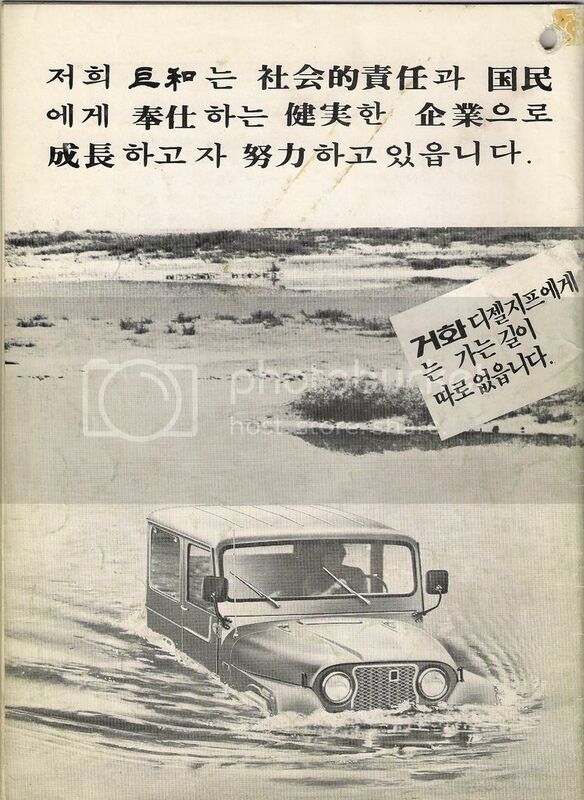 "An account of travel to the five Indian kingdoms"
It is the only 4-passenger open-air car in Korea (combination of unguarded and open-air), powerful force, individuality and sporty style. 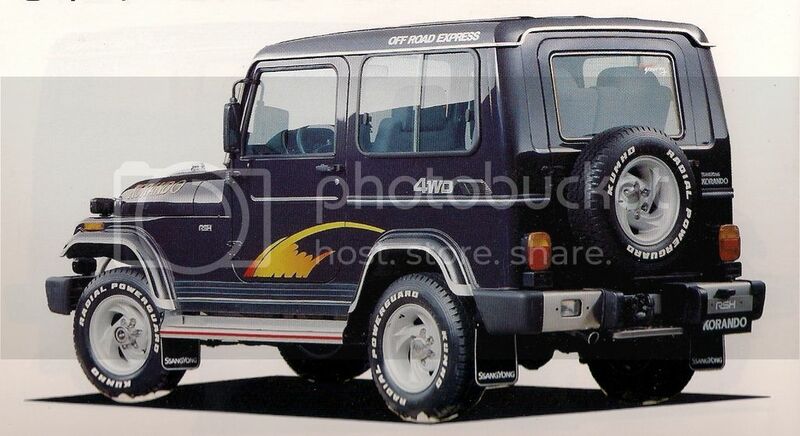 It is a youthful passenger car that enhances the personality and activity of free professionals for leisure. A passenger car suitable for an active businessman with a balance of position, elegance and practicality. It is the best passenger car of 5 passengers with comfortable ride, perfect soundproofing and anti-vibration device and is best for communication and guidance of government offices and companies. 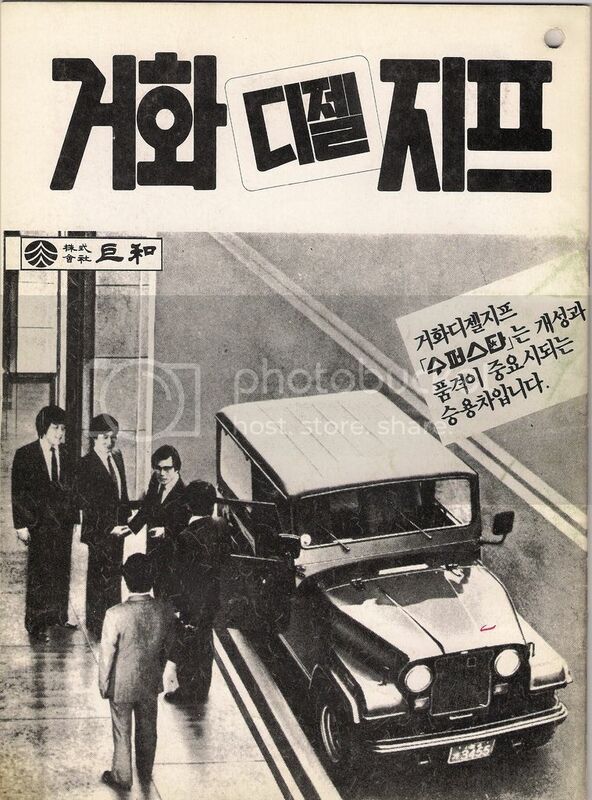 It is the only 6 passenger car in Korea. 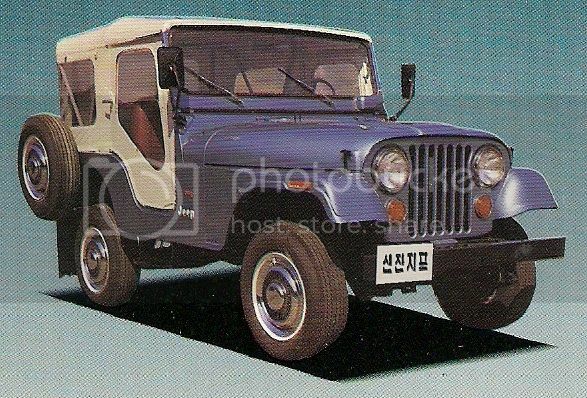 It is the first 3-door tailgate type in Korea and it is convenient to get on and off. It can be used for various purposes such as company business or local business taxi. It is a multipurpose freight car with high maneuverability by mounting a trailer for three passengers and cargo and equipment. 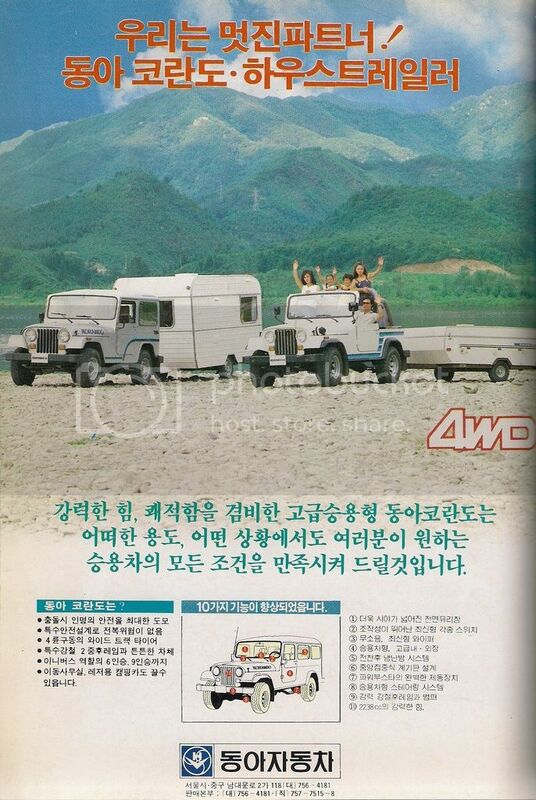 It is the first 9-passenger multipurpose vans in Korea and it is the best for the office site office. It can also be used as a bedroom for a family when the seat is opened for leisure use. It is suitable for emergency use such as hospital and civil defense training because it shows quick maneuverability on road of any bad condition for safe patient transportation, and it is possible to operate not only complex city but also mountainous wallpaper. 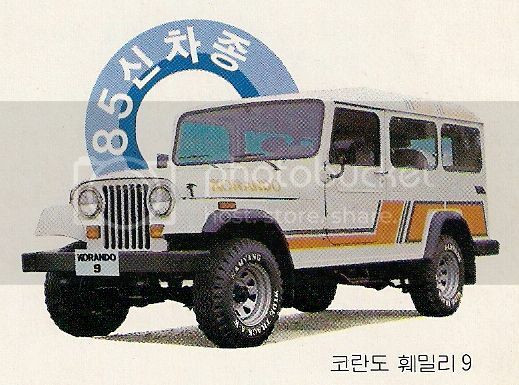 In February 1985, Keohwa and Dong-A Automotive Technology Team cooperated and developed and released the 1985 Korando, which improved the Jeep model to a versatile mass. 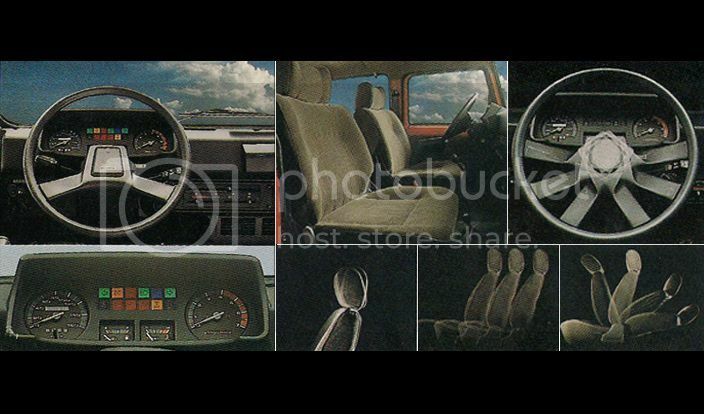 The 1985 'Korando' series of six models, including 'Korando Family 9', 'Van' and 'Ambulance', are specially designed to maximize the safety of the driver and passengers. The dashboard, wide front windshield, all-weather cooling and heating system, and 2,238 cc of Isuzu high-performance diesel engine are installed to further enhance the advantages of four-wheel drive. 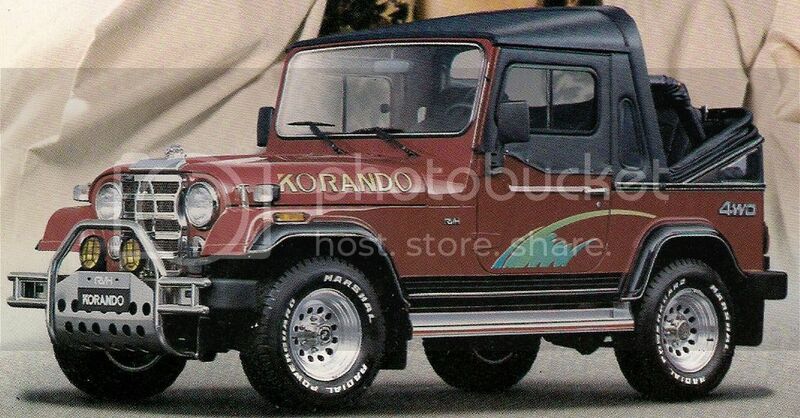 As part of the general promotion and promotional activities for the launch of the 1985 Dong-A Korando series, KAL exhibited 6 different models, starting with 'Korando 6' on the front of the building, attracting many people. 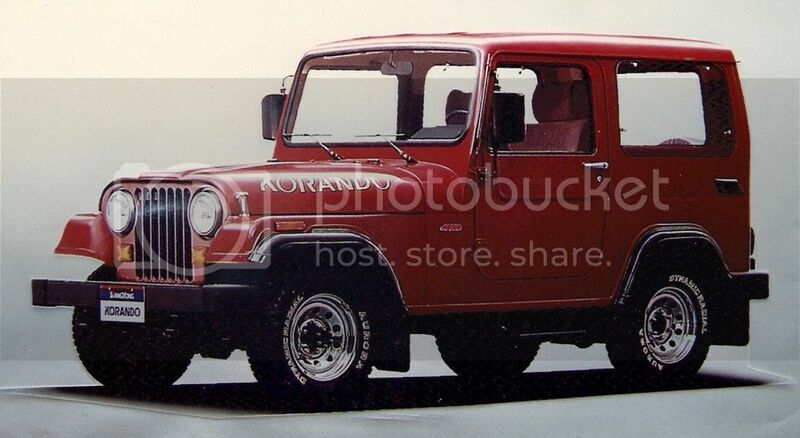 From June 15, 1985, Isuzu launched the 1985 Dong-A Korando series, equipped with the 'G200Z' gasoline engine (1,949cc, 105 horsepower). Compared to the diesel 'Korando', the gasoline model minimizes noise in the car, providing a comfortable, quiet ride and low vibration. 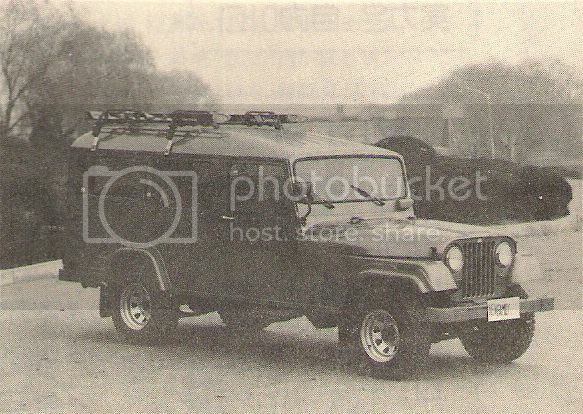 In order to increase exports, six models were developed, including three-seater vans and four-seater, five-seater, six-seater and multi-purpose vans with nine seats and an ambulance. Gasoline model now available to the market. 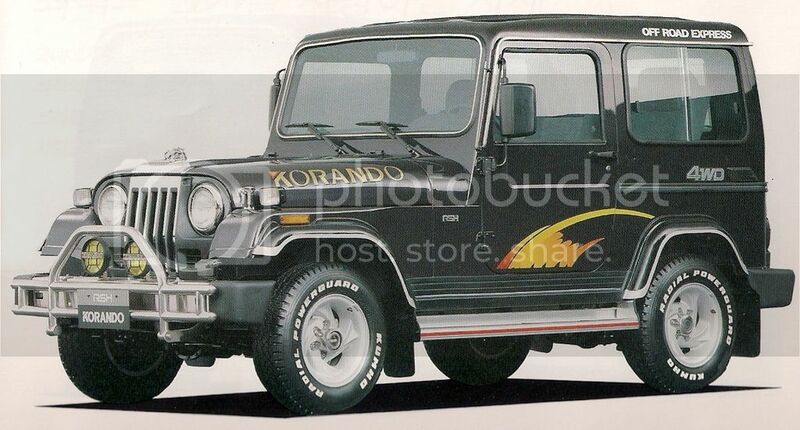 By adopting a heavy and exciting rhinoceros as the "Korando" character and applying it on the hood, I created a more robust and sophisticated image. 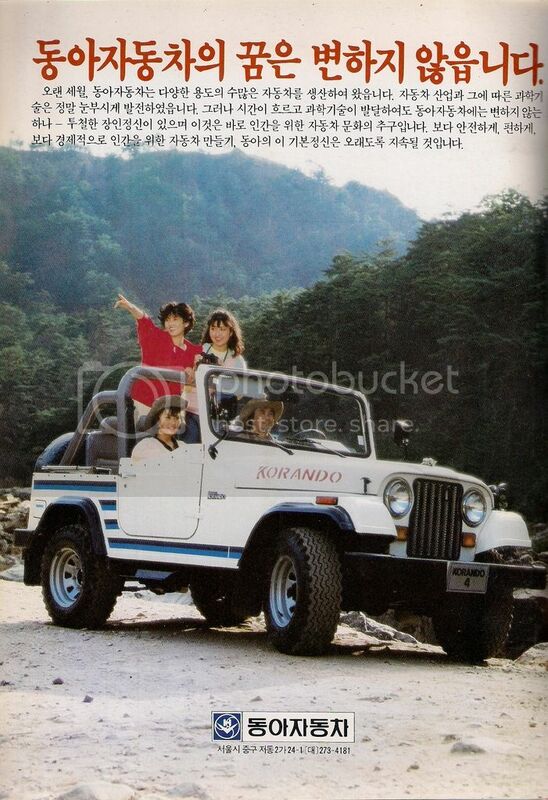 From March 19, 1986 KBS's weekly drama 'Natalia' appeared 'Korando'. Although it was adapted to the situation in the drama, it attracted viewers with its unique design. 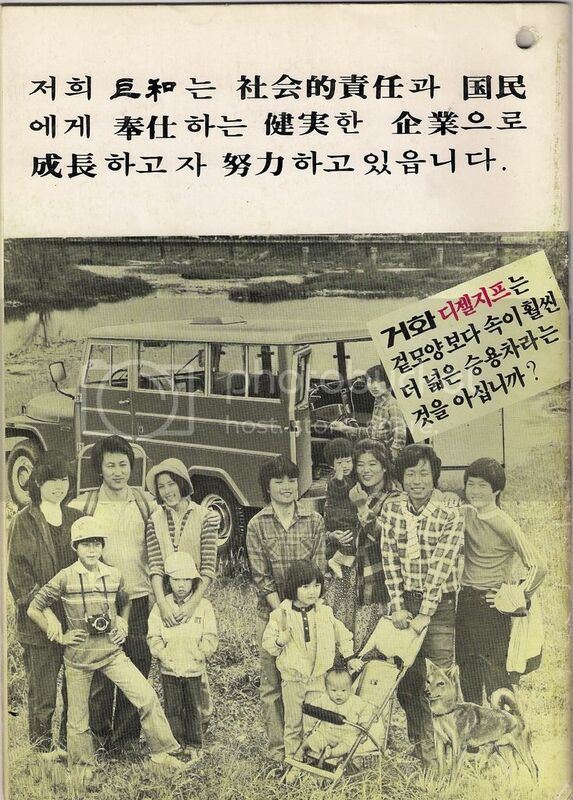 'Natalia' was popularly shown as a work that depicted the ordinary life and love of North Koreans who were out of the anti-communist drama. 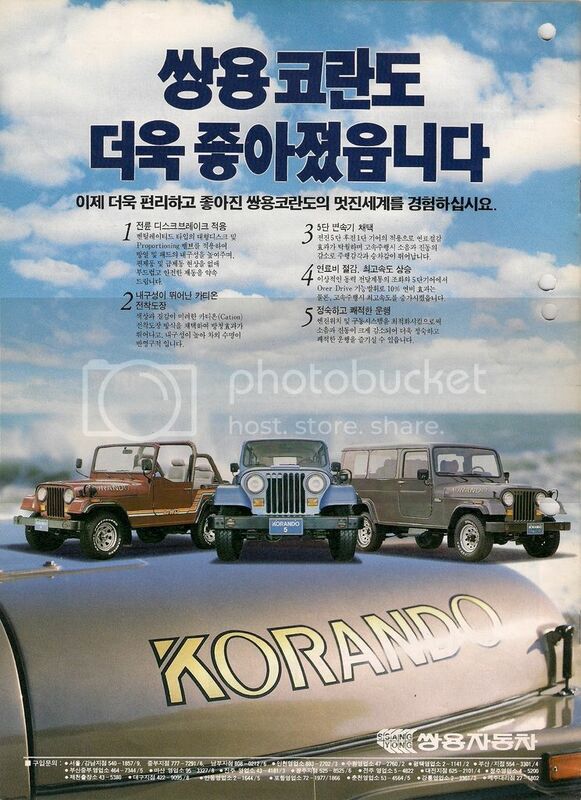 On May 30, 1986, Korea exported "Korando" to the Japanese market. In order to provide fast after-sales service with the sales network, a company established by a contractor with a total sales contract was in charge of sales, and a service network was installed with a maintenance factory in Japan, did. 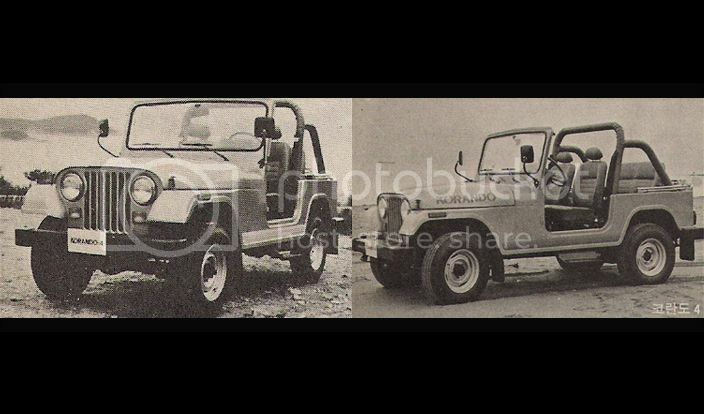 In June 1986, the company has developed and released 'Korando 5', 'Korando 6', and 'Korando Van' in a gentle curve and modern style, reflecting the needs of customers. 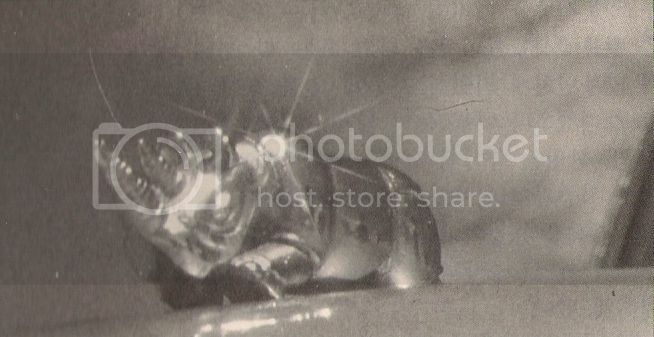 All kinds of interior fittings have been upgraded with style change, and 'Laminate' safety glass is used for all kinds of vehicles to assure the safety of passengers even in the event of a collision, to increase the width of front and rear glass and side glass to improve visibility, I increased my sense of driving. 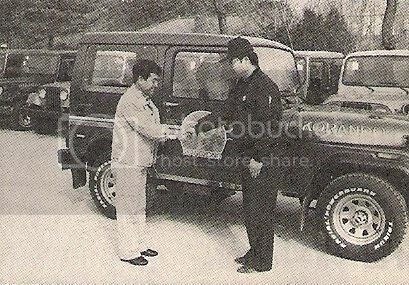 On Feb. 15, 1987, he donated 'Korando 6' free of charge in hopes that he will do more meaningful work for the famous MC Popeye Lee Sang-yong, who is the chairman of the Children's Protection Society and works for various promotions. The donated 'Korando 6' was painted with Ssangyong's image on the left and Popeye's painting on the right. 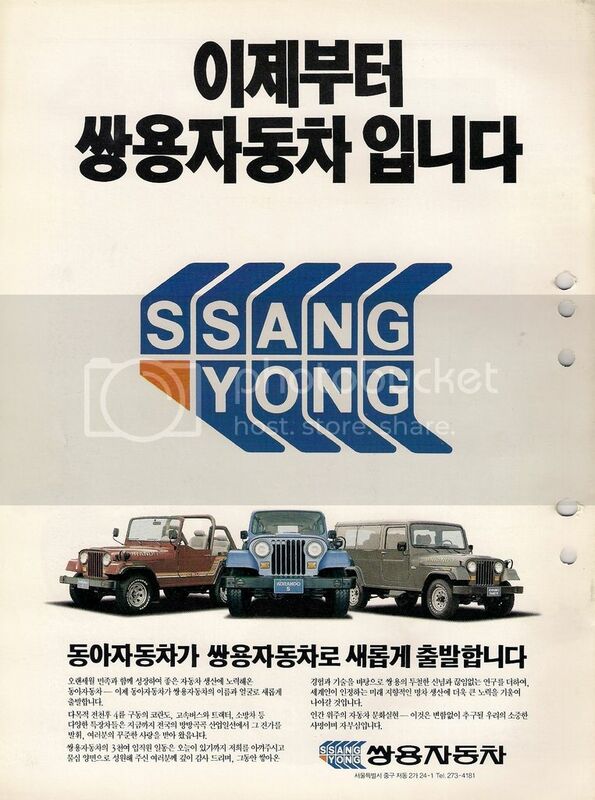 At the donation ceremony, Lee said, "Ssangyong" was delighted with the joke that it was the same as his name. 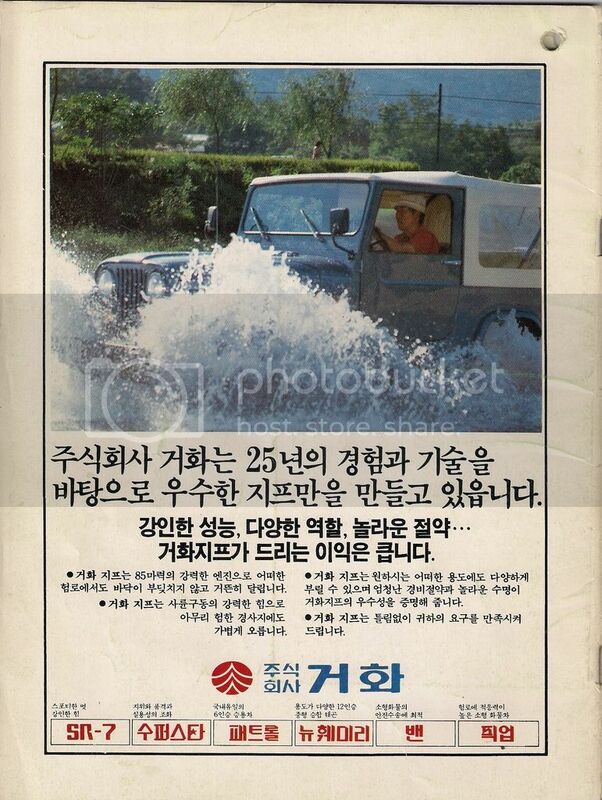 (My translation): In March 1988, SsangYong Motor started the export program to Norway. The company plans to export to Germany and then later on to France and Italy for the European market. 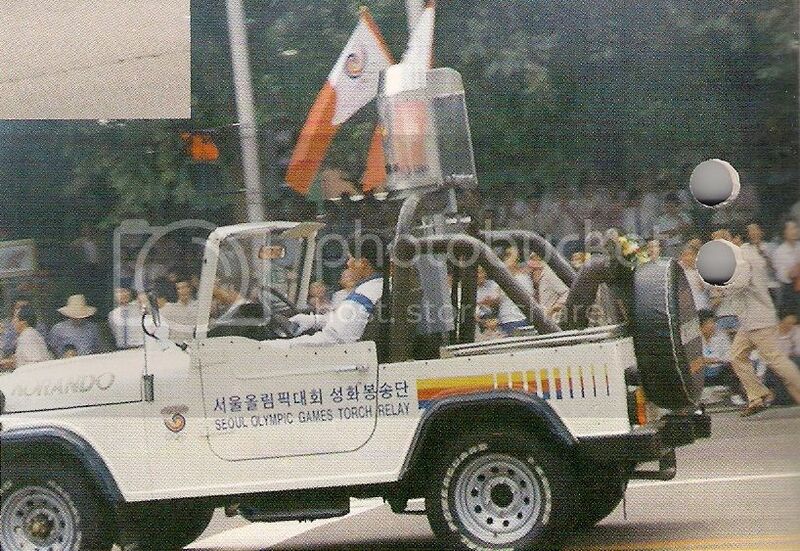 In response to the request of the Seoul Olympic Organizing Committee (SLOOC) Torchonbong Song Business Division, we provided four "Korando" open cars to the torch relay vehicles from August 27 to September 17, 1988. It ran with the fire of peace of mankind in the cargo transportation section of the 4,167km long bunkong road between Jeju Island and Seoul. In the meantime, in order to successfully carry the torch car, service car was permanently installed in the whole area, and four "korando" open cars that were completed torch relay were provided as support vehicles for the organizers. 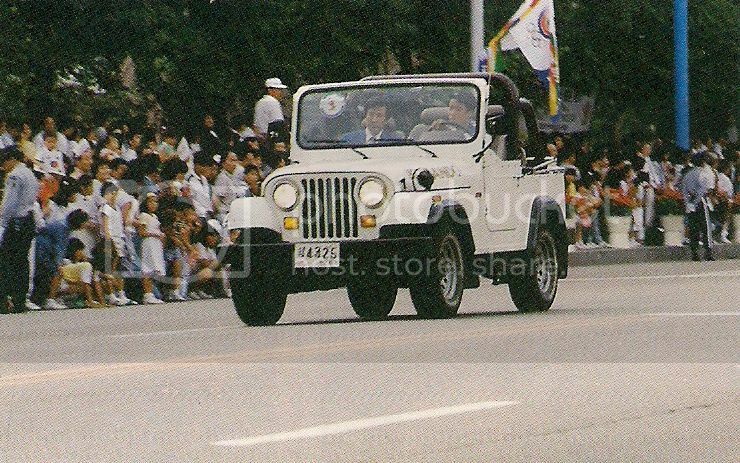 In order to celebrate the Olympic Games in Seoul, the 'Korando' was crowned as the leader in the 'flower car industry' which spread from Jongno to Yeouido on September 15th. 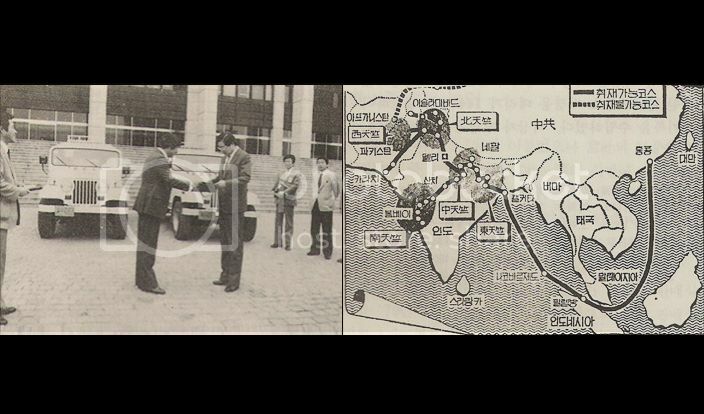 In the request of the French coordination team, He was responsible for the transportation. 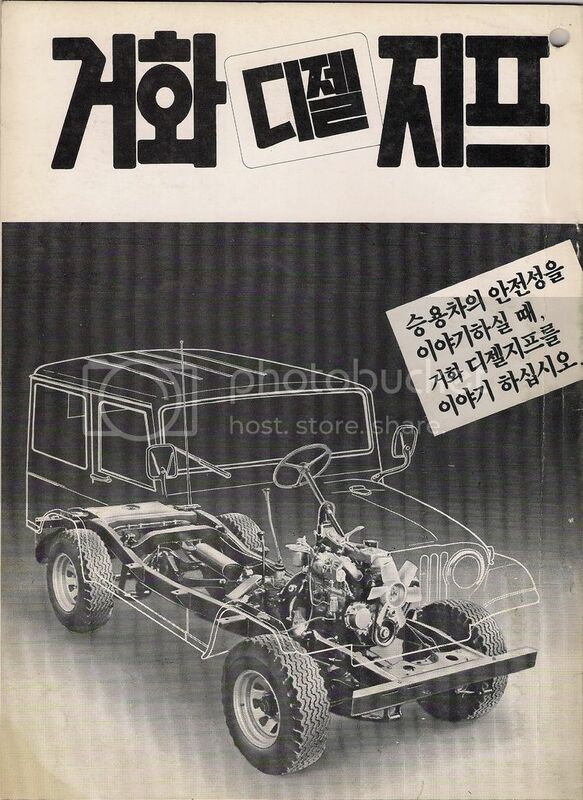 On September 7, 1988, we showed Korando 6, Korando 4, Panther's 'Kallista', 'Solo I' and 'Solo II' simultaneously at the KOEX 2nd floor group exhibition hall. It was screened and got a great response to the visitors. 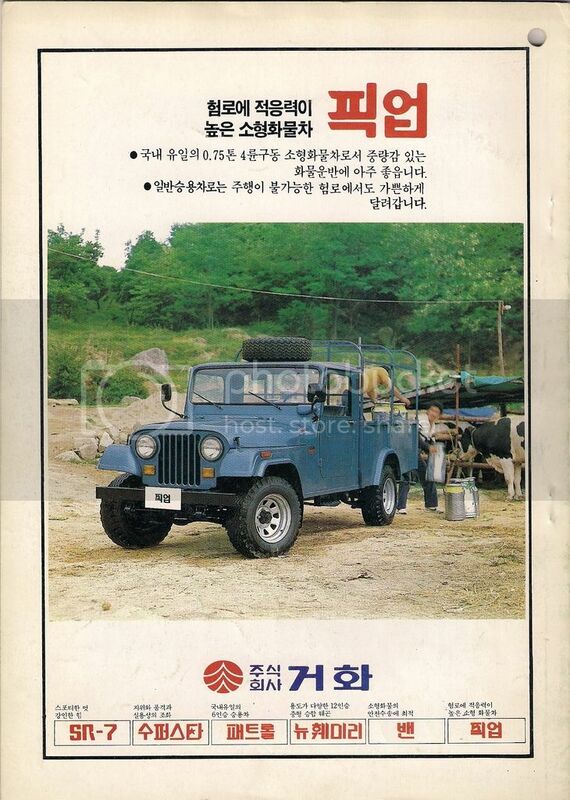 Director Lee Jang-ho's "Miss Rhinoceros Mr. Korando"
I received a big response from the director of Lee Jang Ho, who was screened at Seoul theater from July 22, 1989, to sponsor 'Miss Rhinoceros Mr. Korando' with 'Korando'. 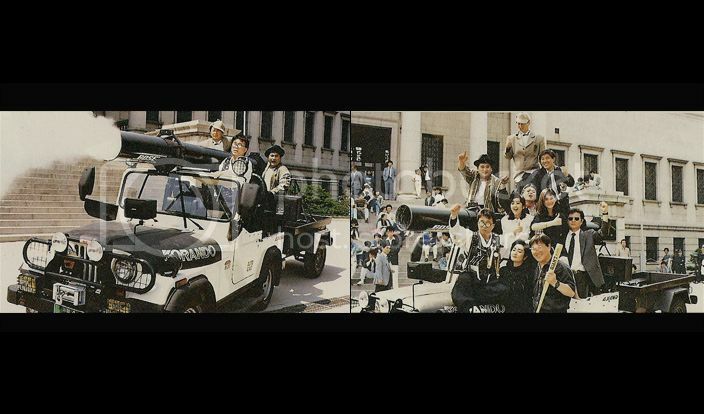 In this film, which deals with the story of a young man and a woman fighting against human trafficking organization, the 'Korando' was specially designed as a cannon, xylophone, and a large speaker. On February 18, 1990, Korando participated in the 10th Cypriot rally, winning the first international rally in the domestic auto industry. The annual Cypriot rally, which has been held every year since 1980, is a competition in which four-wheel drive makers and car enthusiasts compete for individual speed, endurance, durability and jumping ability on unpaved roads. 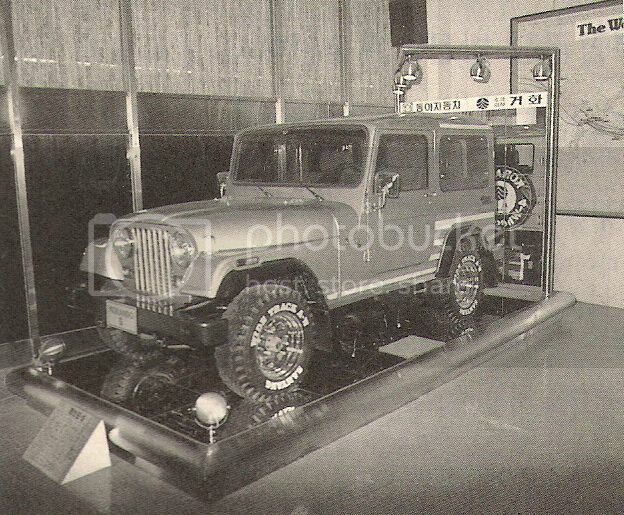 The 10th competition includes world famous 4WD vehicles such as 'Land Rover' in the UK, 'Pajero' in Japan, 'Bitara', 'Land Cruiser', 'Patrol' , 'Land Rover' and 'Pajero' were ranked in the first, second and third places, respectively. 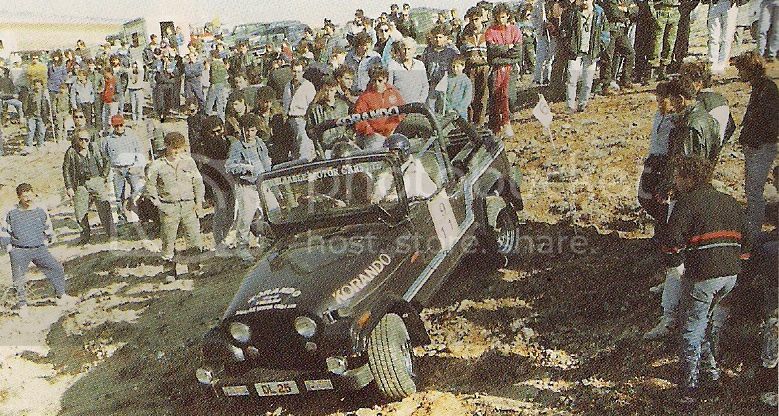 "Korando" won the world championship for the sixth consecutive year for the first time in the world such as 1991 and 1992. 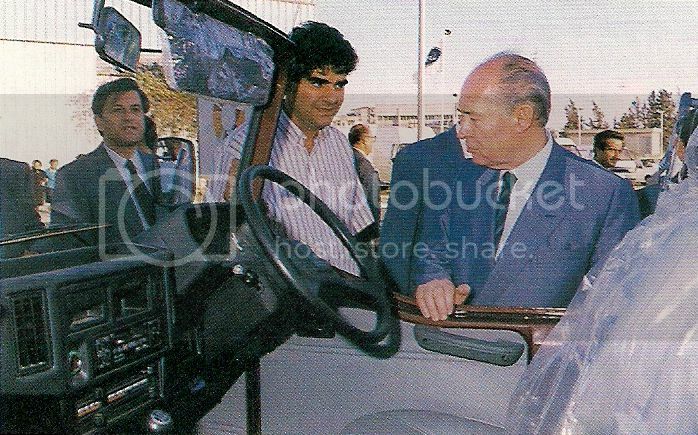 From May 25, 1990 to June 3, 1990, 'KORANDO' participated in the International Fair in Nicosia. More than half of all citizens of Cyprus participated in this international fair, including 23 countries including the EC, USA and Japan. President Vasiliou of the Republic of Cyprus visited the exhibition "Korando" The popularity of the "Korando", which won the world's best 4WD vehicles in the last rally in February, won the most attention. 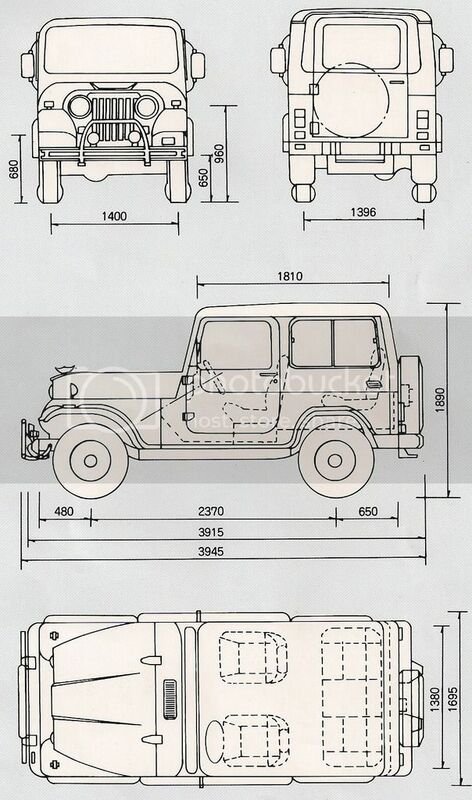 Style: Side protector moldings, waist line molding, body stripes, and other accessories have been added to the standard model to distinguish it from the standard model. 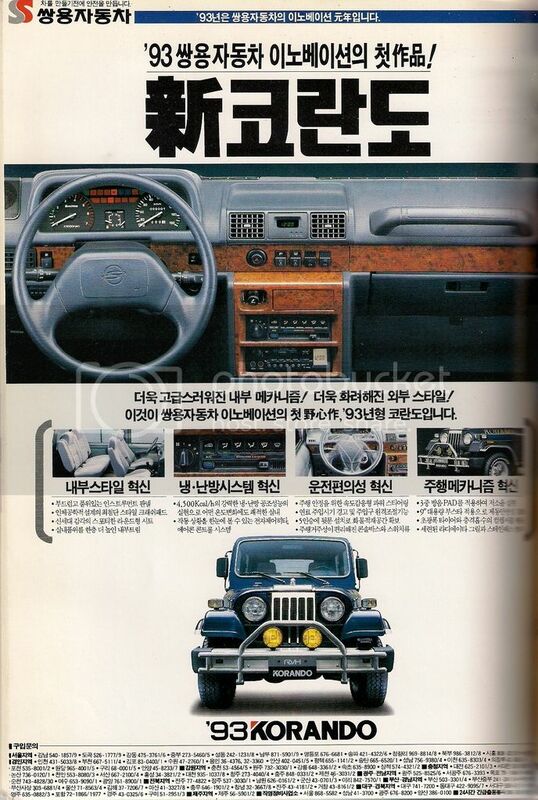 Interior: Centralized door locks, tachometer and various seat functions were added to the specification, and power steering and preheater were adopted as options to pursue the convenience of the driver and passengers. 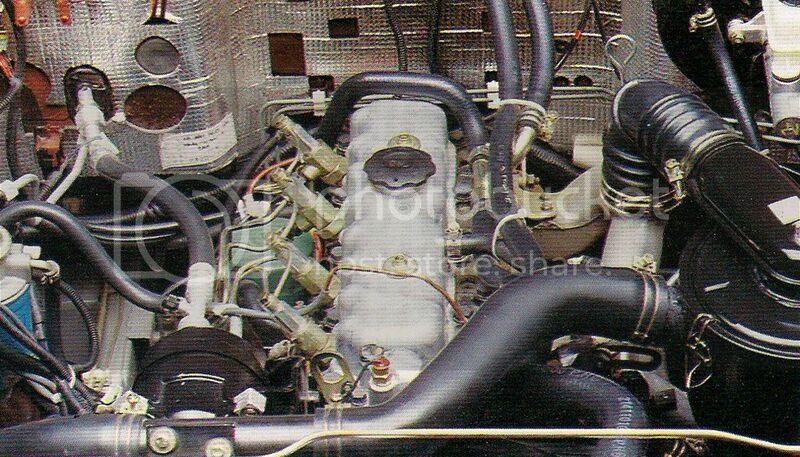 Engine: Powered by a powerful diesel engine 'DC23', the engine's output, acceleration, fuel economy and acceleration have been improved, and a premium carpet has been laid to prevent engine noise. 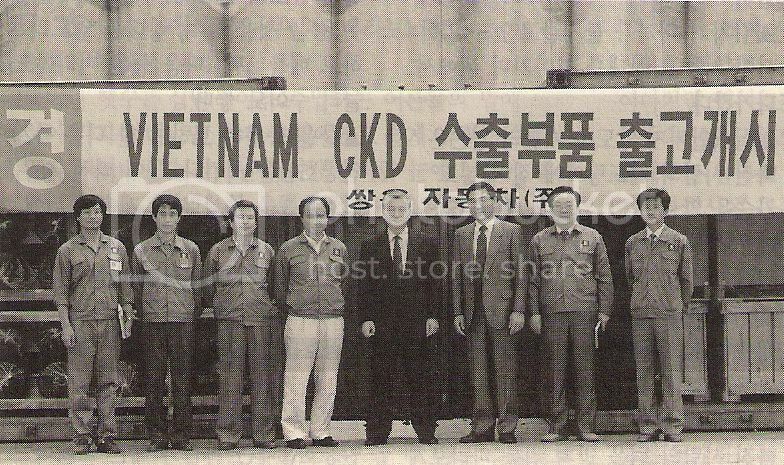 On June 24, 1991, we signed a contract to supply 1,700 units (1,200 units of Korando Family and 500 units of Korando) monthly with 100 ~ 200 units of Vietnam, and shipped 60 units of 'Korando Family' as the first contract. The export was made through the Complete Knock Down (CKD) method, which supplied the parts of 'Korando' and 'Korando Family' to Mekong, a Vietnamese subsidiary, and assembled, produced and sold locally. 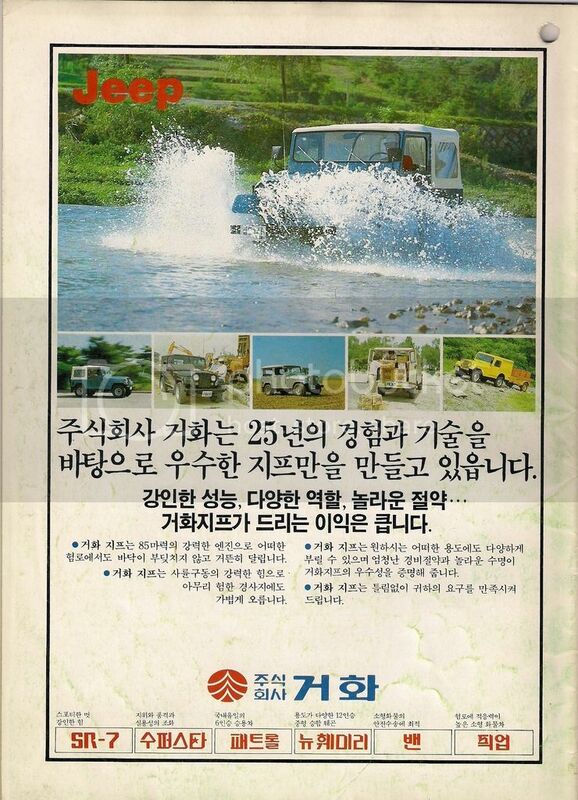 Vietnam's CKD exports of 4WD vehicles worth $17 million per year are the first among Southeast Asian countries. On July 16, 1991, the company developed and launched the 'Korando RV', equipped with the 'XD3P' diesel engine of French Peugeot, which boasts a powerful power of 2,498cc 79 horsepower. The 'Korando RV' is not only equipped with the lightweight engine of Peugeot's state-of-the-art design, but also minimizes friction in the engine, resulting in low oil consumption and excellent fuel economy. 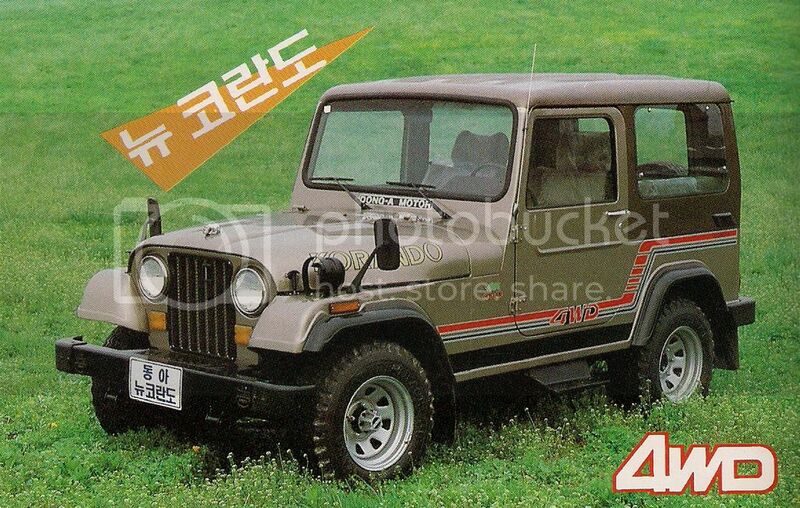 It also has excellent startability and shorten the engine warm-up time. It also has power steering as an option, and is excellent in steering and driving stability even in narrow spaces or at high speeds. 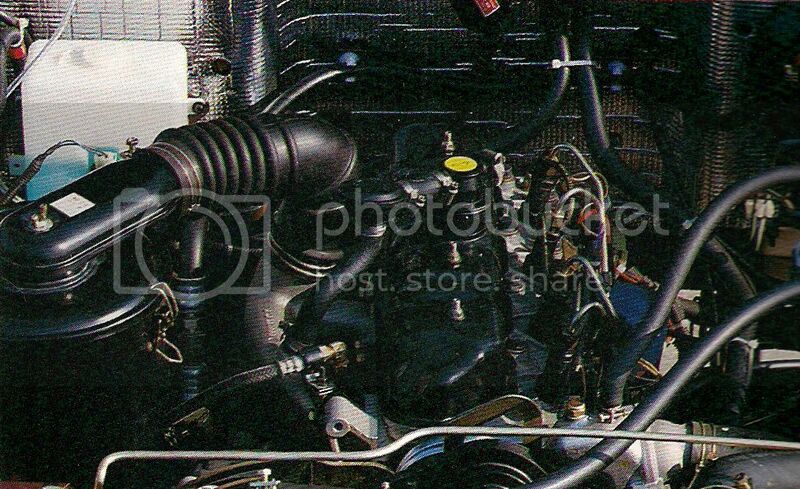 In addition, an automatic tension control timing chain is installed to prevent engine knocking, and a coolant overheat warning light can be attached to the driver, which allows the driver to directly check the engine overheating status. 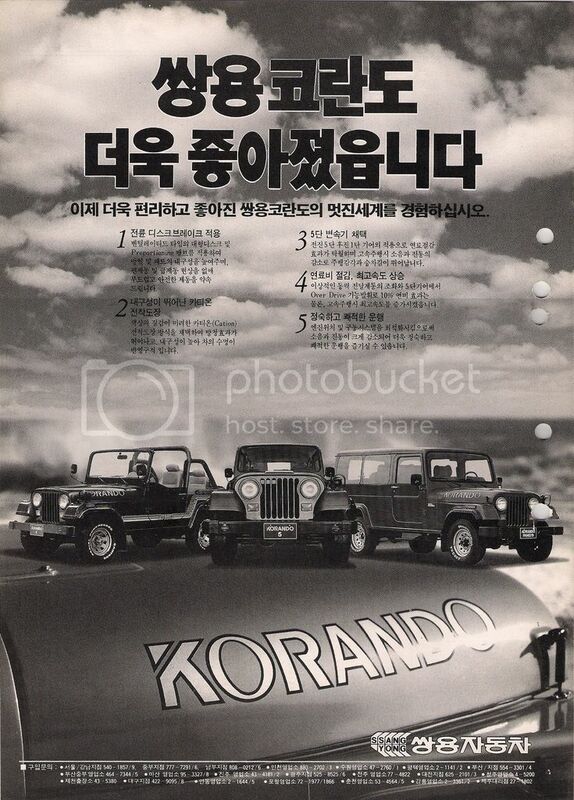 On November 12, 1991, 'Korando' trademark was selected as 1991 excellent trademark in the field of precision appliance automobile in domestic market, and it received an award ceremony (moving the winner-driven business Lee Kun-Woong) at the 14th floor of the Patent Office. 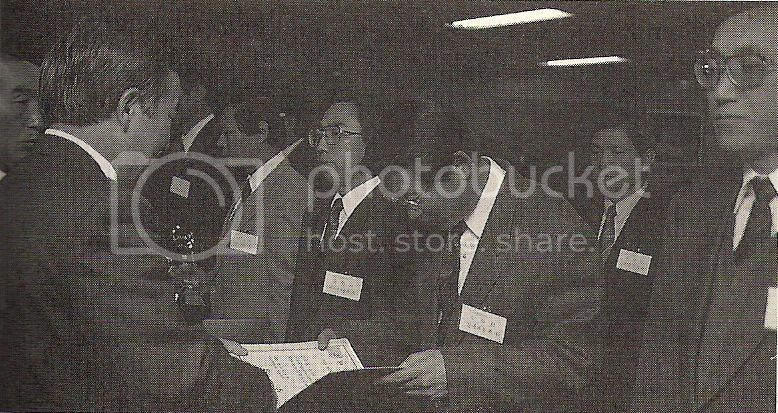 The event was organized by the Korean Intellectual Property Office (KIPO) and was organized by the Korea Invention Patent Association (KIPO). 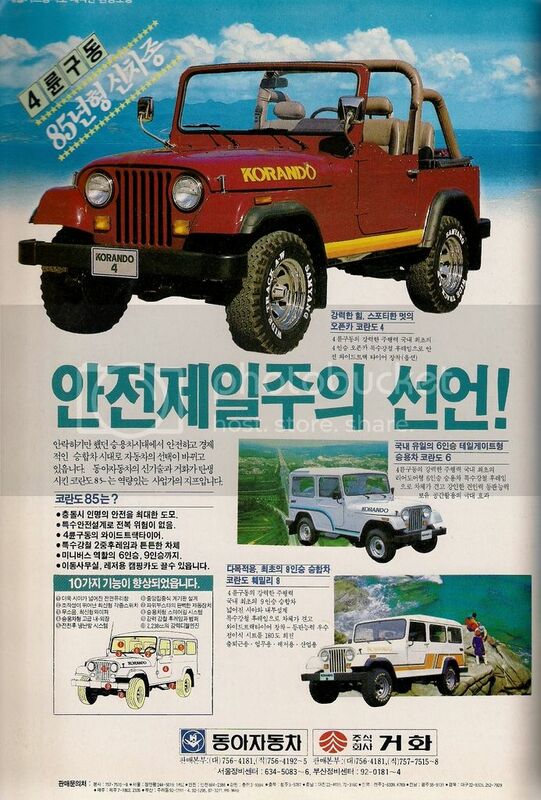 The brand 'Korando' was exhibited in the lobby on the first floor of KOEX in Korea from November 11 to 16 for six days. 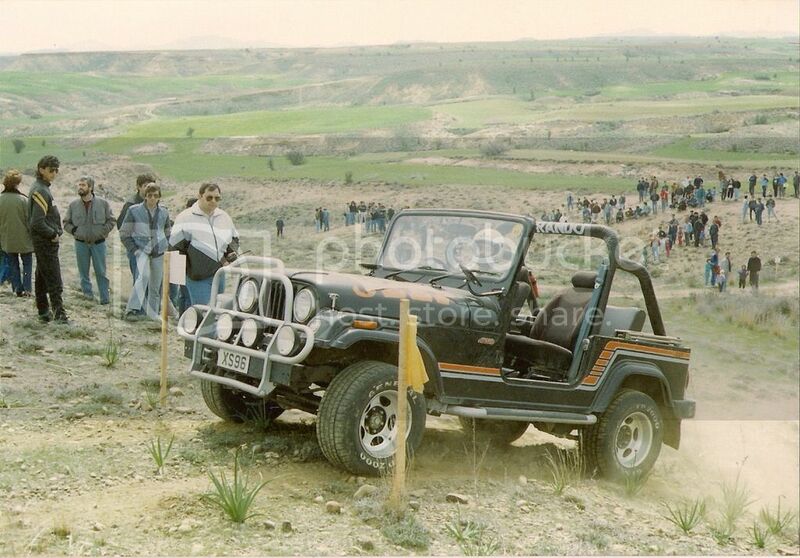 In May 1992, he won the Cyprus 4WD Rally for three consecutive years in the Mediterranean Republic of Cyprus. The 12th edition of the Cyprus Rally is the most traditional car in the Mediterranean and is known for its rugged course. 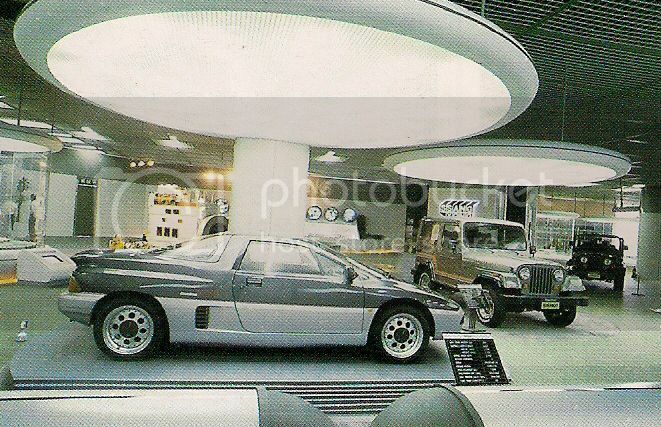 'Korando' won the international car title for the first time in the 10th competition in 1990 and won the international car title for the third time in a row since 1992. 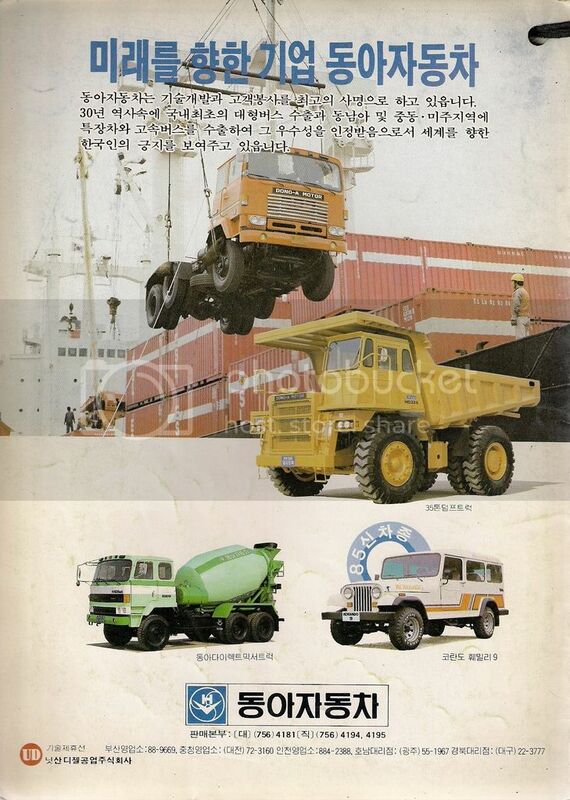 Particularly, it was meaningful that the vehicle exported without specifications or structure change came out to win the world famous 4WD vehicles and win. 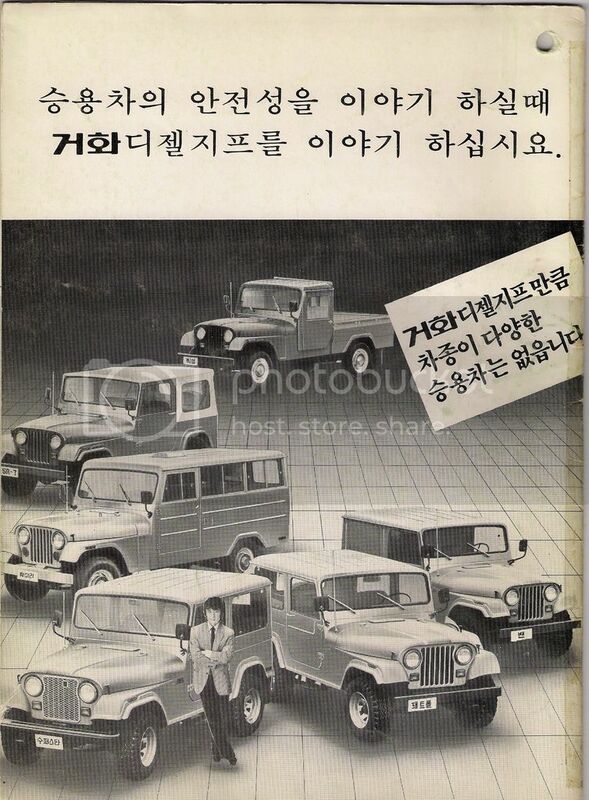 Ssangyong Motors exported the 'Korando' and 'Korando Family' to Korea since its first export of 'Korando' to Cyprus in 1989. 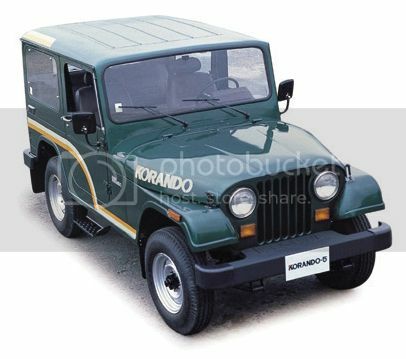 On October 7, 1992, the company developed and marketed a high-deluxe 'Korando' car equipped with high-end specifications and a greatly improved quality. With a bumper guard bar, large fog lights, body stripes and a stainless steel radiator grille on the exterior, it has been refurbished to a strong, sophisticated urban style. 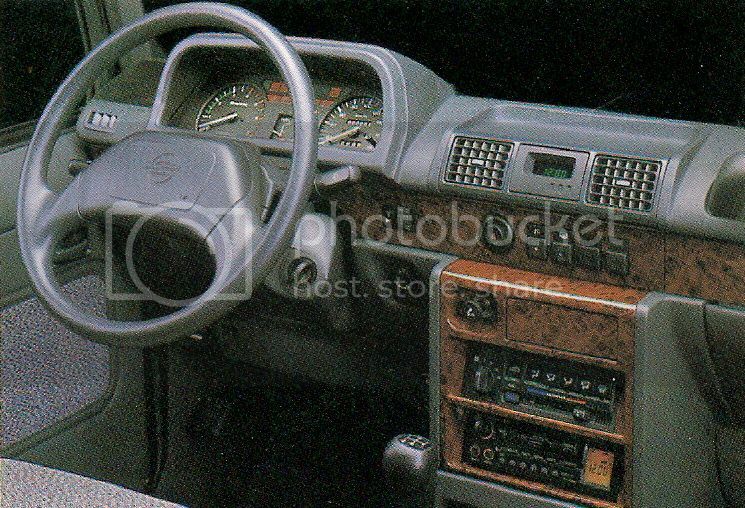 The interior space is luxurious and maximizes the driver's convenience. 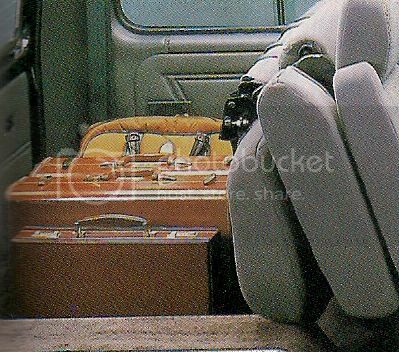 Especially, the first 4WD domestic suspension seat and left / right opening / closing type sliding side window have improved convenience and durability. 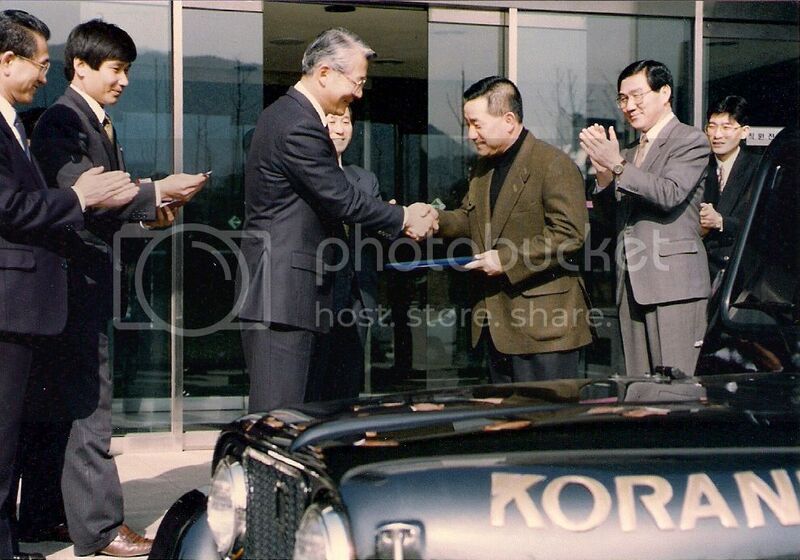 In January 1993, he donated 'Korando' free of charge in hopes that he would do more meaningful work to the famous MC Popeye Lee Sang-yong, who is chairman of the Children's Protection Society, The donation was the second since February 1987. 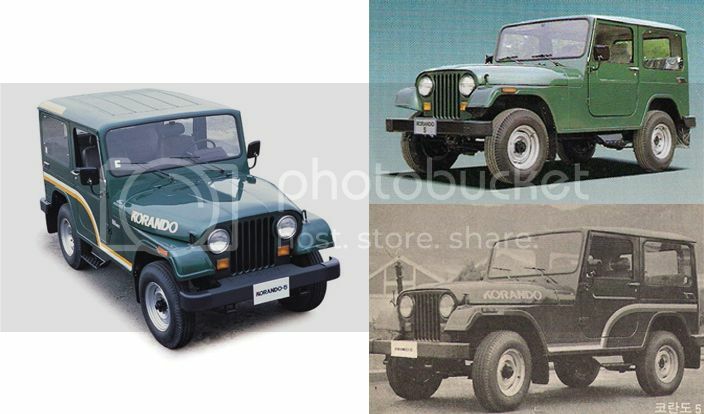 On February 13, 1993, it developed and marketed the '93 Korando', which improved the appearance and performance of the authentic 4WD car 'Korando', resulting in a more powerful 4WD image and driving comfort and ride comfort. 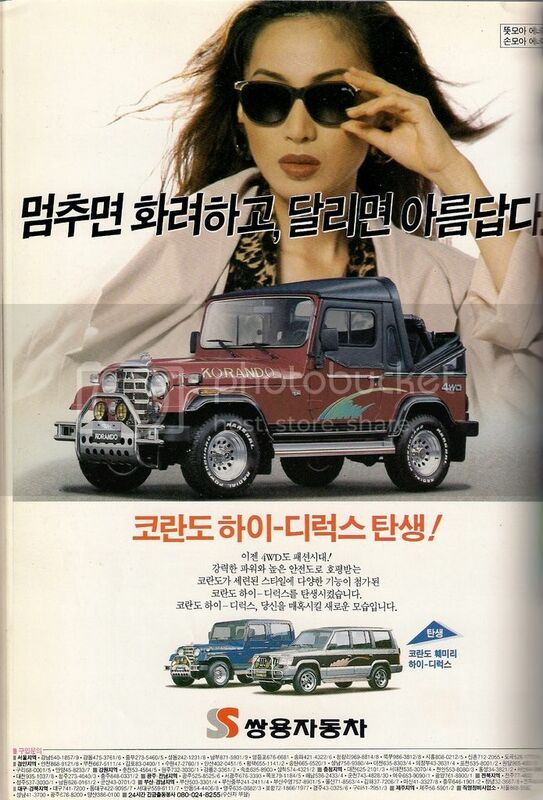 Ssangyong Motor introduced 1993 'KORANDO' as 'Innovation Year One' and greatly improved product performance up to 35 items. 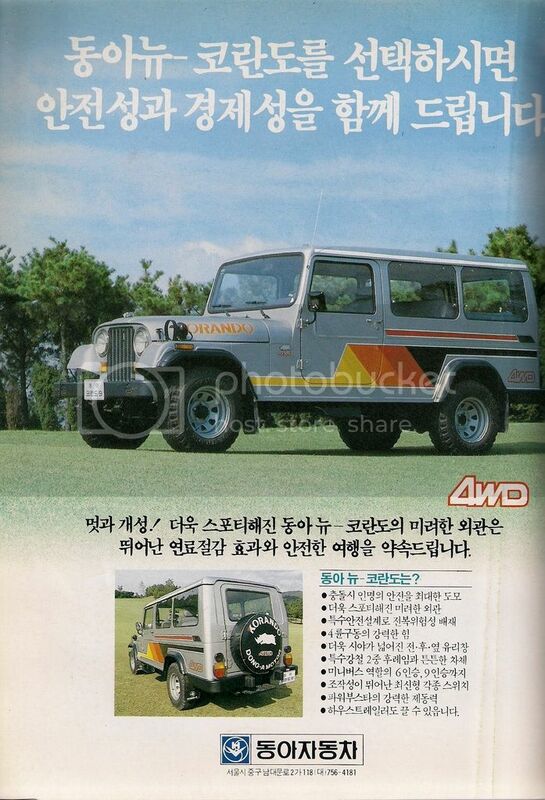 Available 4/5/6/9 passengers version and the price was between 9.2 million won and 13.5 million won. 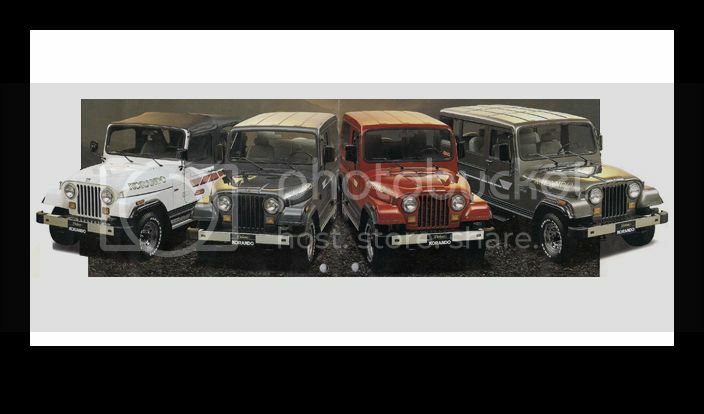 Newly applied to the high quality of authentic Jeep type, new style of stainless steel radiator grill, large fog lamp, stainless steel bumper, aluminum wheel disc, etc., pursued a sophisticated yet robust style that blends classical style with advanced technology. The Rhinoceros character in the center of the hood highlights the strength and high-end image that can feel the characteristics of Korando, and the side 'KORANDO' subtitles expresses beauty with a soft curved hood and urethane material. 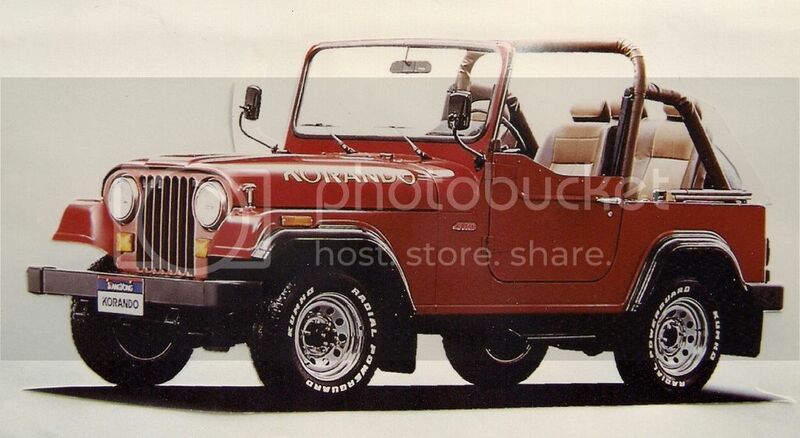 The rear part emphasizes practicality while applying a spare tire locking device, traction ring and stainless step, rear glass brightening, and stainless steel spare tire cover to produce a profound and volume style. It is equipped with an ergonomically designed round style seat / natural wood instrument panel to enhance the quality of the room. The electronic control alarm system (ETACS) that is applied to luxury cars, the one-touch powerful air conditioning system, Power steering, a centralized switch system, various remote control and warning functions have been added to improve driver comfort. In addition, using a triple soundproof pad, greatly reduced noise. It is a state-of-the-art engine with excellent performance of 79 horsepower, acceleration of travel, and ability to climb to the fullest extent anywhere in the city or rough roads. 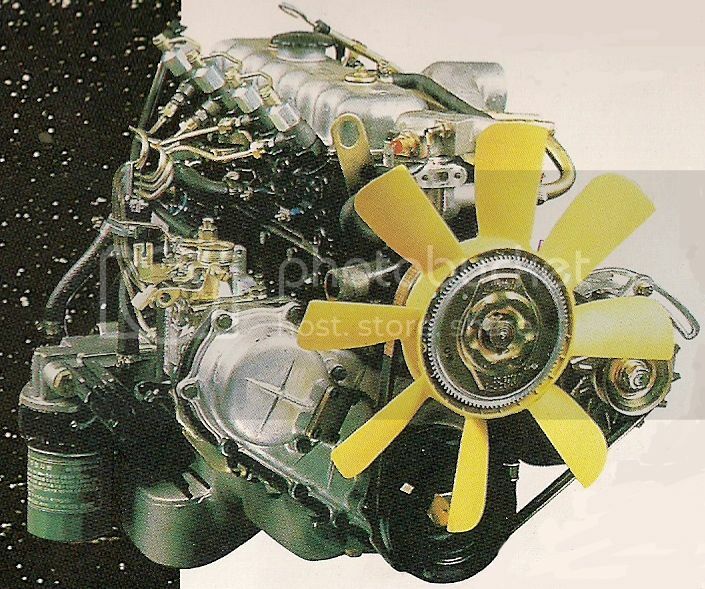 It is the engine with the highest durability by special manufacturing method and heat treatment technology. It has a performance of 72 hp, excellent fuel economy, quiet driving, and acceleration for driving, making it suitable for versatility such as driving in the city center and cargo transportation. 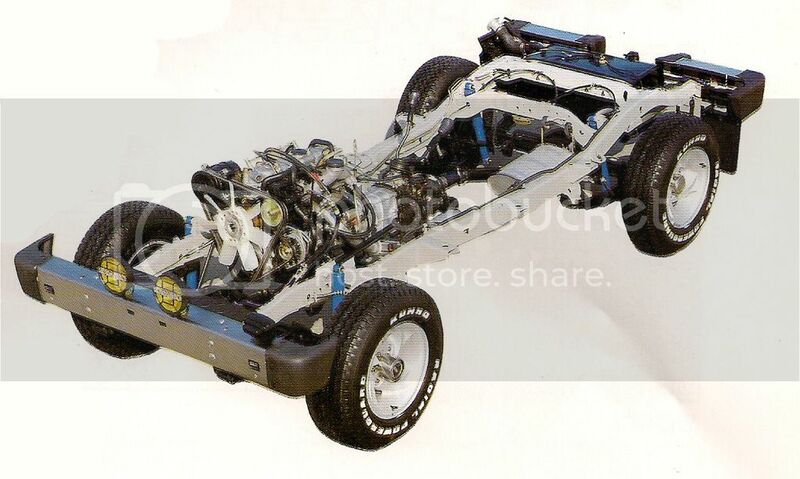 Advanced design by computer with super rigid body structure, 4mm special steel frame, Large (9") booster, caliber (9") booster, advanced limited slip differential (LSD) for improved driving performance and safety. It has greatly reduced the inconvenience of loading / unloading and cargo loading by changing to a 3 door type with a 5-passenger model added with a tail gate. The power window switch, versatile console box, multi-purpose locker, centralized locking device, Box, and front passenger's handles. 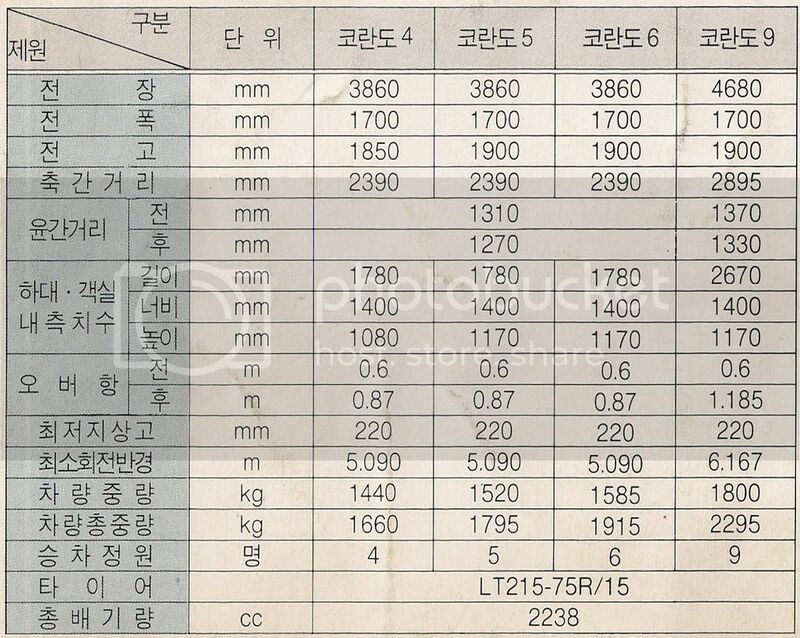 General specification of 1993 SsangYong Korando. 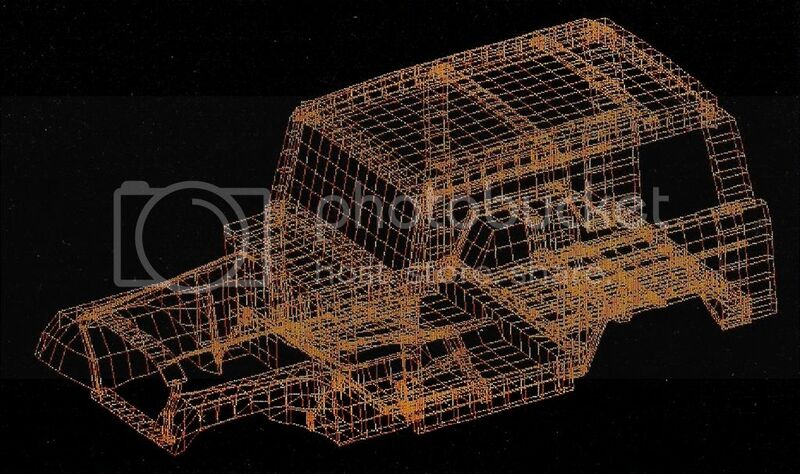 Picture showing second generation SsangYong Korando [KJ] filling into the ship. 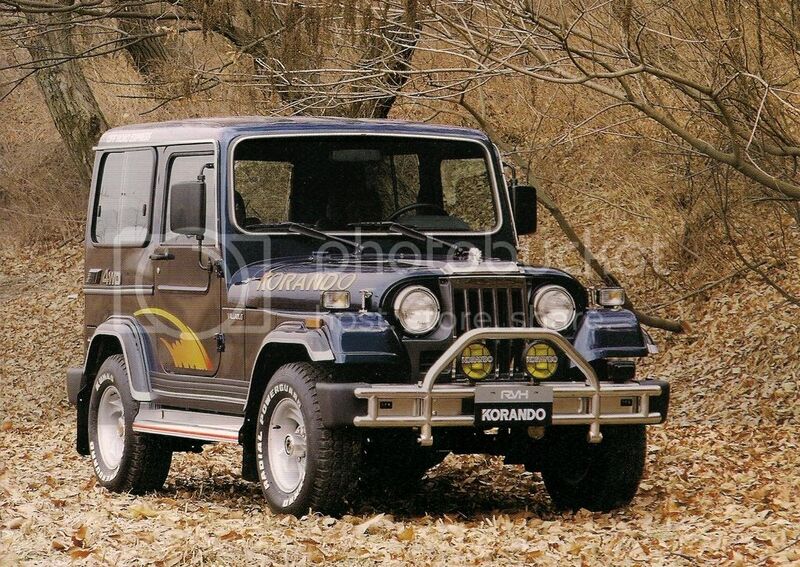 On March 25, 1993, 4WD vehicles such as "Korando" and "Korando Family" successfully entered the Spanish market. 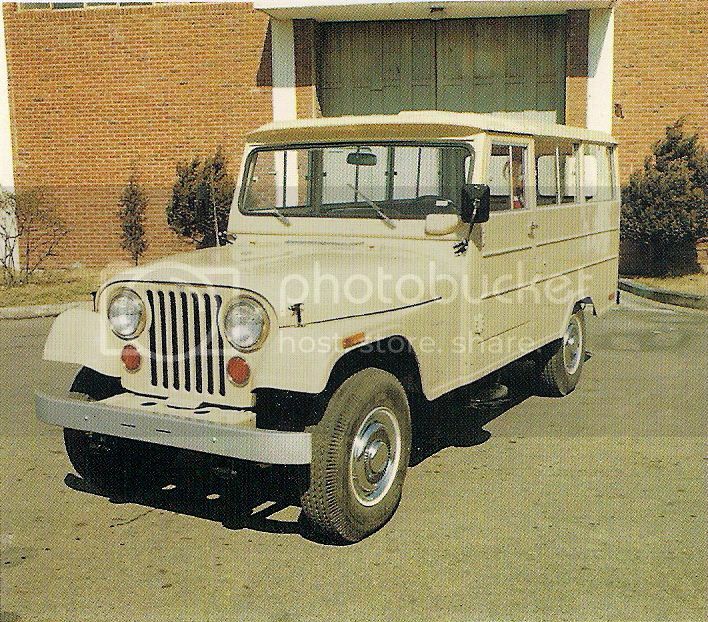 Exports to Spain were made through INTERNED, S. A., a local dealer. 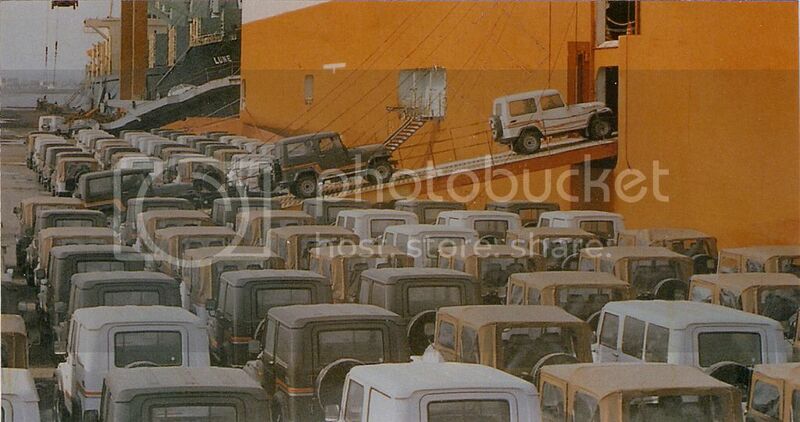 In June 1992, SsangYong Motor signed a contract to export 2,000 4WD vehicles, of which 281 were shipped. Meanwhile, on April 27 (Korea time April 28), we held a commemorative event for 'Korando' Spain and a product briefing for local dealers in Spain. In celebration of the 4WD's entry into Spain, the event was held at the Eurobuilding Hotel in the heart of the Spanish capital, in the presence of more than 150 people including CEO Son Myungwon and Ambassador Kwon Tae-woong. 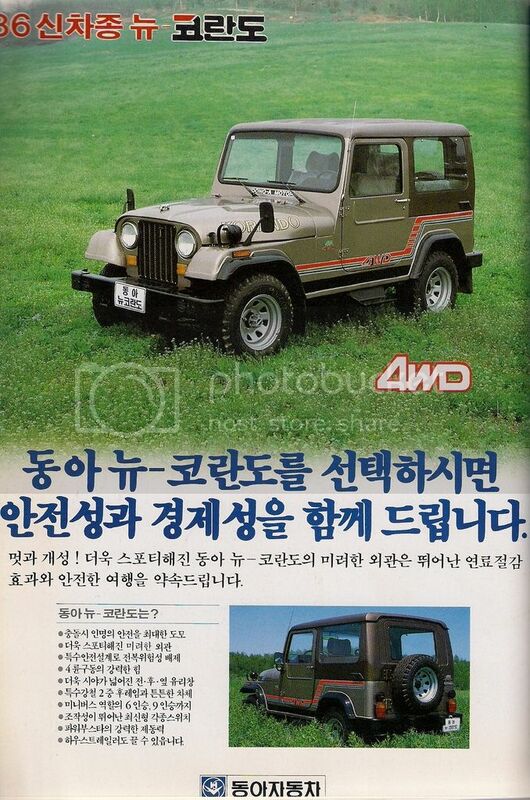 (Author's Note:) This is the last model year that SsangYong Motor website entered for the Jeep CJ series. 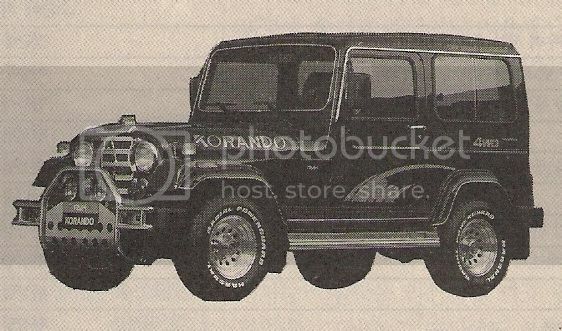 Last one produced in 1995 model year. 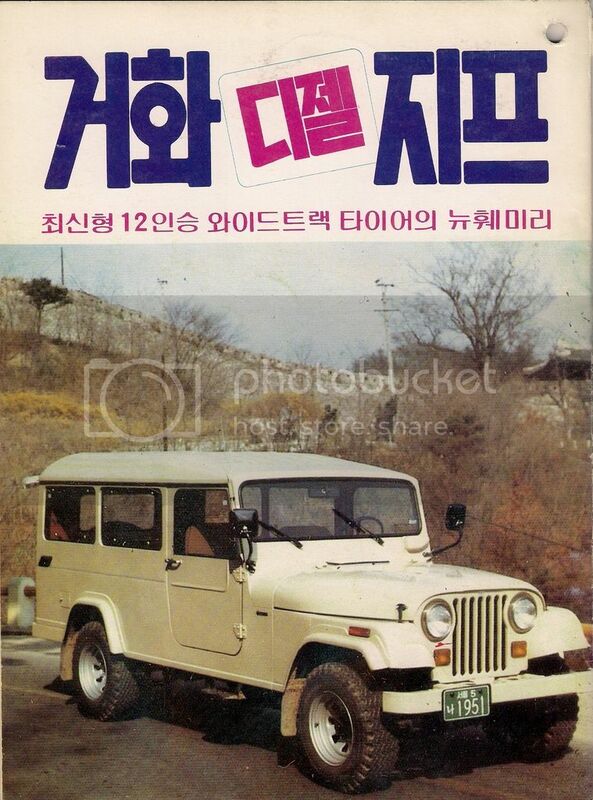 Thank you for joining with us for the history of South Korean's Jeep CJ series.